a-ha's debut album "Hunting High And Low" was released world wide. It was produced by Tony Mansfield, except tracks 1 and 6 by Alan Tarney and track 8 by John Ratcliff with a-ha. It was remixed by John Ratcliff with a-ha except "Hunting High And Low" and "Living A Boy's Adventure Tale" remixed by John Ratcliff. All tracks were written by Pål Waaktaar except track 1 by Pål, Mags and Morten, track 5 by Pål and Morten and tracks 8 and 9 by Mags and Pål. The cover of the German made 10-track CD has a black and white photo of the band taken in a cafe (by Just Loomis) with a grey a-ha-logo and red title in the top left corner. The reverse of the insert is white with 3 small black and white individual pictures of the band members, pencil smudge marks plus black text to the left about "caring for your CD". The catalogue number is printed in black in the top left hand corner. The white insert opens up with track listing on the left hand side and production, mastering and other information printed in black on the right hand side. The back insert of the CD is white with black titles and a black and white picture of a-ha in front of a mirror (as on "Hunting High And Low" single). A barcode is printed in the top right hand corner with both the European "7599-25300-2" and French "WE 835" catalogue numbers printed below. The CD itself was "Made in Germany" and is silver with black titles. There are at least three pressings of this CD available in Europe, some of which come with a yellow round exclamation sticker on the front of the case. Matrix codes known to exist: 925300-2 @ 1, 759925300-2 WME and CD 759925300-2.2 V01. There also exist gold disc editions of the CD album which has similar packaging, but the disc itself is gold with black text. Some copies of the gold CD edition come with a gold sticker on the front which reads "40 GOLDEN GREATS! WEA". The cover of the German made 10-track LP has the same cover design as the CD and was "Manufactured in Germany by Record Service GmbH, Alsdorf", it was used mainly for the release in the UK, Germany and France. On the front cover it displays a 5cm white sticker which reads "INCLUDES THE SINGLES "TAKE ON ME" and "THE SUN ALWAYS SHINES ON T.V. "", it also includes the UK "WX 30" and German "(925300-1)" catalogue numbers. On the back cover at the top right hand corner is the standard barcode 7599-25300-1 with the catalogue numbers for the UK: WX30, Germany: 925 300-1 (U) and France: WE 381 LP release. Additionally included is the Catalogue number for the German Cassette release 925 300-4. Printed along the bottom of the back cover underneath the "Warner Bros. Records Inc." handwriting is some English and French Manufacturing information which reads "Manufactured in Germany by Record Service GmbH, Alsdorf. Presse en Allemagne par Record Service GmbH, Alsdorf a Warner Communications Company". On the record label itself it displays the usual colour "Warner Brothers Records" logo at the top with "a-ha HUNTING HIGH AND LOW" underneath. The full track listing with some production and publishing information "All songs by Pal Waaktaar except as indicated. Produced by Tony Mansfield. Remixed by John Ratcliff with a-ha. Published by: G.B. only) 1-5 ATV Music Ltd. (P) + (C) 1985 Warner Bros. Records Inc. for the U.S. & WEA International Inc. for the world outside of the U.S." is also shown. Displayed on the left hand side are the "STEREO" and "GEMA/BIEM" logos with the catalogue number "925 300-1" and "WX30" at the bottom. Around the outer edge of the label is the manufacturing and copyright information which has been printed in all three languages English, French and German. The reverse of the LP is white with 3 small black and white individual pictures of the band members, similar to the back of the CD insert, but with the CD care information replaced with other text in grey. One side of the inner sleeve is white with a black and white large picture of a-ha in front of a mirror (as on the back sleeve of the CD), the other side is black with the negative version of the same picture. There is a second European release which was re-issued by Reprise and comes with the exact same front cover as the first pressing but now includes a slightly larger 7cm white sticker displaying the same information as the previous release. The same Manufactured in Germany by Record Service GmbH, Alsdorf. Presse en Allemagne par Record Service GmbH, Alsdorf a Warner Communications Company is also shown at the bottom of the back cover. On the actual record label itself, the same layout and design has again been used, but an additional Reprise Logo has now been printed on the label. The regular inner sleeve has also been included. There is another European Reprise LP release which was again Manufactured in Germany by Record Service GmbH, Alsdorf and comes with the same regular sleeve as the earlier pressings, although it doesn't include the additional round white sticker on the front cover. On the actual label itself, it comes with the same layout and design as the earlier Reprise issue, but the German part of the Catalogue number has now changed from 925 300-1 to use the more standard European Catalogue number which reads 7599-25300-1. The inner sleeve as usual has also been included. The first pressing of the cassette was "Manufactured in Germany by Record Service GmbH Alsdorf". 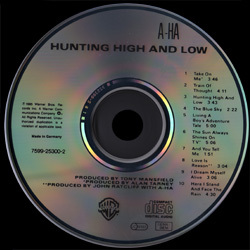 The front cover of the insert displays the same artwork picture used on the LP/CD release, a large "a-ha" logo is printed in grey at the top and the title "hunting high and low" in red at the bottom. On the spine, all the text is again printed in red and displayed landscape down the spine, "A-HA" with the title "HUNTING HIGH AND LOW" underneath is shown on the left hand side and the three European catalogue numbers and "WB Records" logo is displayed on the right hand side. The catalogue numbers being "UK:WX30C" for the UK, "925 300-4(U)" for Germany and "FRANCE WE 481". The back cover text is printed all in black, it displays the track listing for side one on the left hand side and side two on the right hand side, a white barcode displaying the number "7599-25300-4" is displayed in the centre. Some track production information to "Tony Mansfield", "Alan Tarney" and "John Ratcliff" is also included. On the inside of the insert, all the text is again printed all in black, there is some track production credits, photographic credits to "Just Loomis" and the "a-ha Fan Club address at The Post Office, High Street, Headley, Bordon, Hants, GU35 8BQ England". The "WB Records" logo and contact address is also shown "Warner Bros. Records Inc. - 3300 Warner Blvd, Burbank, Calif 91510". On the back of the actual spine there is some Manufacturing information which reads "Manufactured in Germany by Record Service GmbH Alsdorf - Presse en Allemagne par Record Service GmbH Alsdorf a Warner Communications Company". Some copies of the Insert come with an extended back cover which covers up the whole of the tape, it includes two round holes in order to allow the pins of the cassette case to fit through. 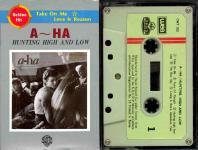 The cassette is black with grey text and displays the title "a-ha / HUNTING HIGH AND LOW" at the top with the track listing underneath. At the bottom of of side 1 we have some copyright information which reads "All rights of the producer and of the owner of the work reproduced reserved!. Unauthorised copying, hiring, public performance and broadcasting of this recording prohibited". On side 2 at the bottom is some production and record company information which reads "Produced by Tony Mansfield. Remixed by John Ratcliff with a-ha. (P) + (C) 1985 Warner Bros. Records Inc. for the U.S. & WEA International Inc. for the world outside of the U.S.". On the left hand side of each side is the "WB Records" & "BIEM GEMA" logos, plus the German 925 300-4 and UK WX 30C catalogue numbers. The "Dolby X-pro B-NR" logo is also displayed at the bottom right hand corner of each side. The second pressing comes with the exact same insert as the first pressing which was "Manufactured in Germany by Record Service GmbH Alsdorf". Some copies again come with the extended back cover to cover up the whole tape. The actual cassette is black with a silver stick-on label and black printed text. The layout and design is slightly different compared to the first pressed tape, the font size is some what smaller on some of the text including the title at the top which is now printed in lower case, the "WB Records" logo on the left hand side is also larger compared to the earlier pressing, plus the Dolby logo on the bottom right hand corner of each side now shows "DOLBY SYSTEM". The same two catalogue numbers are used on this second pressing "925 300-4" for Germany and "WX 30C" for the UK. The third pressing of cassette comes with a similar insert to the first two German made pressings but was instead "Manufactured by Warner Music Europe", the usual text "Manufactured in Germany by Record Service Aldorf" has been omitted from the back of the inside spine. The cassette is light grey and printed with black text, the layout and design has again been slightly changed compared to the earlier pressings. The "WB Records" logo and catalogue numbers "925 300-4 / WX 30C" have moved higher up on the left hand side, plus the track listing underneath the title at the top has been split into three lines. The "DOLBY SYSTEM" logo is again displayed at the bottom right hand corner of each side. There is another pressing of the cassette which was again "Manufactured in Germany by Record Service GmbH Alsdorf" and comes with a slightly amended spine on the insert, the "WB Records" logo is printed across the spine with the 3 cataloigue numbers in smaller font underneath, rather than along the spine as per the previous releases. The French catalogue number reads "FRANCE WE 421" (instead of "FRANCE WE 481") and the German one has a circled G after the number, rather than a U. The actual cassette is transparent with a grey centre and white text, the catalogue number on the left hand side has changed to read "7599-25300-4", plus the layout and design, including the font size of the text has also been changed. The production information on side 2 has also been amended to read "Produced by Tony Mansfield Side 1: *Remixed by John Ratcliff **PRODUCED BY ALAN TARNEY Side 2: *PRODUCED BY ALAN TARNEY **PRODUCED BY JOHN RATCLIFF WITH a-ha (P) + (C) 1985 Warner Bros. Records Inc. for the U.S. & WEA International Inc. for the world outside of the U.S.". The "Dolby HX-pro B-NR" logo is shown at the bottom right hand corner of each side. A slight variation of the above pressing is one with a round yellow sticker displaying a white ! symbol on the front plus "Warner Music" and "Warner Music Group" logos inscribed into the plastic on the back cover and side of the box. The cassette itself is similar except for the catalogue number displayed reads "925 300-4" compared to earlier edition which have "7599-25300-4". There is another pressing which has an almost identical sleeve to the first pressing, but doesn't have the "Manufactured in Germany by Record Service GmbH Alsdorf" text printed down the inside spine of the insert. It also has oval holes punched into the sleeve, rather than the circular ones of the first release. The cassette is white with black titles. Tracks: Take On Me (3:46) / Train Of Thought (4:11) / Hunting High And Low (3:43) / The Blue Sky (2:22) / Living A Boy's Adventure Tale (5:00) // The Sun Always Shines On T.V. (5:06) / And You Tell Me (1:51) / Love Is Reason (3:04) / I Dream Myself Alive (3:06) / Here I Stand And Face The Rain (4:30). The Argentine LP release has "caza mayor y menor" listed as the title "Hunting High And Low" on the front cover; it is coloured in a darker red. Note that the correct Spanish translation of "Hunting High And Low" should be "Cazando por arriba y por abajo" or "Cazando por todas partes" (thanks to Roberto Delgado) or "Buscandote por todos lados" (thanks to Jose Arambula). The title printed on the sleeve is a literal translation, which does not make any proper sense. There is a "WEA" logo included in the upper right-hand corner and the remainder of the regular album cover print is of a darker black and white. On the reverse of the sleeve, the full track listing down the left-hand side and other regular production and photographic credits is all listed in Spanish e.g. "Take On Me" is written as "tomalo por mi". The a-ha fan club address is also present but lists "england" as "inglateera" at the end, with some additional Spanish production text printed underneath it; "℗ 1985 Warner Bros. Records Inc. para los Estados Unidos & WEA International Inc. para el resto del mundo". The three usual back and white pictures of the three band members are included on the right-hand side. There is no barcode present at the top right-hand corner, but instead displays a different Catalogue number 80934 compared to the UK release. Along the bottom of the back sleeve is some record company and copyright information which has again been translated into Spanish; "wea discos s.r.l. Una Compania del Grupo Warner Communications. Prohibida la reproduccion, locacion y prestamo de este ejemplar y su radiodifusion o ejecucion publica. Reservados todos los derechos de los autores de las obras y del productor de fonogramas". The regular black "WB RECORDS" logo is included as usual in the bottom right-hand corner. The record itself comes with white labels and black printed Spanish text. The regular colour "WB RECORDS" logo is included at the top with the title "CAZA MAYOR Y MENOR" and "a-ha (Interprete)" printed underneath. Some other production text; "Prod. por Tony Mansfield-(*) Prod. por Alan Tarney" and "(**) Prod. por John Ratcliff con a-ha" (on side B only) is also shown. Above the "WB RECORDS" logo, there is some manufacturing and distributing information; "PUBLICADO POR wea discos s.r.l. FABRICADO Y DISTRIBUIDO POR EMI-ODEON SAIC San Martin 3590 – Florida (Pcia. de Bs. As.)". On the left-hand side, the Argentine Catalogue number 80934 A or B is shown including the side reference, whilst on the right-hand side, it instead displays the standard US Catalogue number 25 300-A or B and again includes the side reference within. Below the centre hole, the full track listing is shown with all the tracks again listed in both Spanish and English, the track lengths and some track credits are also included alongside. At the bottom of label on each side is some additional record company production text; "℗ 1985 Warner Bros Rec. Inc. para los EE.UU & WEA Int. para el resto del mundo". Around the outer rim of the label is; "MARCA REGISTRADA SADAIC-BIEM" and "INDUSTRIA ARGENTINA AADI-CAPIF", plus some other Spanish Copyright information; "RESERVADOS DERECHOS DE LOS AUTORES, INTERPRETES Y PRODUCTORIES FONOGRAFICOS SOBRE OBRAS GRABADAS EN ESTE DISCO. PROHIBIDA SU REPRODUCCION PUBLICA O PRIVADA, ALQUILER, CANJE O EJECUCION PUBLICA." which reads the same on both sides. The inside of the LP comes without an inner sleeve. The promo edition is the regular LP with a "Promocional, phohibida su venta" stamp. The Argentine CD edition is similar to the European release, displaying the title "a-ha hunting high and low" in English rather than Spanish which appears on the Argentine LP & Cassette release of the album. The front of the CD case also comes with an "ifpi" hologram sticker, most of the text at the bottom left hand corner of the back sleeve and around the outer edge of the actual disc is printed in Spanish; "warner bros records inc., a warner communications company ℗ 1985 warner bros. records inc. para los estados unidos y wea international inc. para el resto del mundo. Reservados todos los derechos del productor, de los autores y de los interpretes de las obras reproducidas en este ejemplar, prohibida la reproduccion, regrabacion, alquiler, prestamo, canje, ejecucion publica, radiodifusion y cualquier uso no autorizado de estos fonogramas. Publicado y distribuido por Warner Music Argentina S.A. SADAIC - BIEM/AADI - CAPIF, DISCO ES CULTURA. INDUSTRIA ARGENTINA." The back sleeve and actual disc also indicate that the album was distributed & published by Warner Music Argentina S.A. The cassette release also uses the title "Caza Mayor Y Menor". The cover on the first pressing is black with the regular artwork at the top and the title in white underneath, the "DOLBY SYSTEM" text at the bottom left hand corner is very faint and can hardly be seen. The inside of the insert is white with blue text, listing the tracks in Argentinian and English. The cassette was made by "EMSA" and is cream with brown text. The catalogue number on this first pressing is 4-25300. The second pressing is very similar to the earlier pressing including having the same front cover artworks, but comes with a different catalogue number 90934, the "DOLBY SYSTEM" text has been printed much clearer on this copy. The inside of the insert is again white with blue text, it now includes some additional manufacturing information printed in Spanish on the inside of the back cover which reads "Fabricado y distribuido por EMI ODEON S.A.I.C. San Martin 3590 - Florida". The actual tape is now coloured white with brown text, it displays the same additional "EMI" manufacturing information on the bottom left hand corner which didn't appear on the first pressing. There was another Argentine cassette pressing which was again released by "EMI", but comes again with a different catalogue number 93934. The front cover artworks is the same, but the inside of the insert is now printed with black text instead of the usual blue which was used on the earlier pressings. The information is however exactly the same including the additional "EMI" manufacturing information. The tape is again coloured white, although there appears to be two slightly different issues of it, some copies come with blue printed text, whilst others have brown printed text. The information and layout is however exactly the same on both. There are at least two slightly different Australian CD pressings of "Hunting High And Low". The disc on both pressings was made in Australia and the text on the disc differs slightly and includes a "Digital Audio Technologies Australia" logo plus Australian catalogue number. The sleeve is similar to the European release, but the back sleeve differs slightly with the text "Manufactured and Distributed by WEA Reecords a Division of Warner Music Australia. The inside of the back cover on some copies is just plain black, whilst other copies advertises original masters by other artists (the original masters text can be seen through the spine). More original masters are advertised in the centre pages of the front insert on both copies. There is another Australian CD release which comes instead with a black disc with silver text, this edition was included in the Australian Trilogy box set, so its not confirmed as to whether this CD was available separately or not. The front cover comes with the regular artworks but was not branded under the "ORIGINAL MASTERS" series shown through the spine. On the back sleeve, it comes with a much smaller barcode including having a different number "9 325583 035289". The Catalogue number has also been simplified to 253002. At the bottom left hand corner there is some different Manufacturing and Distributing information which reads "warner bros. records inc., a warner music group company. Artwork © 1985 warner bros. records inc. All Recordings (P) 1985 warner bros. records inc. for the u.s. and wea international inc. for the world outside of the u.s. all rights reserved. Unauthorised duplication is a violation of applicable laws. Marketed in Australia by Warner Music Australia Pty. Limited under exclusive licence. Manufactured and distributed by Warner Music Australia A Warner Time Group Company. www.warnermusic.com.au". On the spine the Catalogue number has been printed slightly larger compared to the earlier pressings. The release also comes inside with the same folded insert but doesn’t include any adverts on the centre pages. The disc as mentioned above is black and the title "A-HA HUNTING HIGH AND LOW" is displayed at the top. At the bottom it includes the Catalogue number and the same Manufacturing and distributing information which appears on the back sleeve. The Australian LP release of "Hunting High And Low" includes the regular front and back cover artworks but was instead; "Marketed by WEA Record and Tape Distributors Pty Limited". There is an additional green and white squared sticker included on the front sleeve displaying the text and Catalogue number; "FEATURES THE HIT "take on me" plus "train of thought" and "the sun always shines on T.V." 25300.1". On the back sleeve, the colour shading of the background on the left-hand side containing the regular track listing, production text and a-ha fan club address is somewhat darker. The usual barcode included at the top right-hand corner of the back sleeve has been withdrawn and replaced instead with the catalogue numbers for both the Australian LP 25300-1 and (Cassette 25300-4) release. Also included inside is the usual inner sleeve but with the amended black copyright text; "© 1985 warner bros. records inc. made in u.s.a. 25300-1". The record includes white labels with black printed text and displays the regular colour "WB RECORDS" logo at the top. 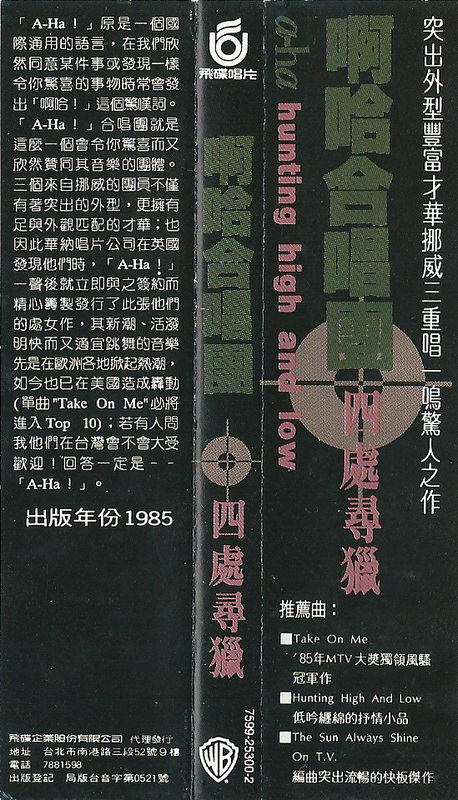 The title "HUNTING HIGH AND LOW" with a-ha is printed underneath. On the left-hand side, the word "STEREO" and the catalogue number 25300-1 is included, along with an additional reference MX210651 and some record company production information; "℗ 1985 WEA International Inc.". A large bold side reference number "1" or "2" is located on the right. At the lower half of the label is the full track listing to each side including track lengths and track credits. Some publishing information; "All songs published by ATV Northern Songs" and regular production credits "Produced by Tony Mansfield. Remixed by John Ratcliff with a-ha. *Remixed by John Ratcliff. **Produced by Alan Tarney." is shown. The label also displays that the LP was "Manufactured & Distributed by WEA Records Pty. Limited" and includes "a Warner Communications Company®" name and logo. Around the bottom outer rim of the label on each side is some copyright information; "ALL RIGHTS OF THE MANUFACTURER AND OF THE OWNER OF THE RECORDED WORK RESERVED. UNAUTHORISED PUBLIC PERFORMANCE, BROADCASTING, LEASING AND COPYRIGHT OF THIS RECORD PROHIBITED. WEA RECORDS PTY. LIMITED". The Australian cassette was "Marketed by WEA Record and Tape Distributors Pty Limited", the front cover comes with title "a-ha" printed in light green and "hunting high and low" in red, along the top we have a three part blue banner with the "DOLBY HR PRO" logo on the left, "COBALT HIGH-TECH" in the centre and the catalogue number 25300-4 on the right. The usual artworks is displayed under the title on the bottom half. The spine is also blue displaying the title in white text, the usual "WB", "COBALT HIGH-TECH" and "DOLBY HR PRO" logo's are also present along with the catalogue number. The back cover is white and displays the full track listing in black, some Dolby information is also included. The actual tape is black with a black stick-on label, the text is all printed in grey. The track listing is shown at the top and the title HUNTING HIGH AND LOW - a-ha with the Marketing information at the bottom. "Microservice": The first pressing doesn't have a barcode on the back, the second one has the barcode and also has an additional "M" in front of the catalogue number and different Warner Music Brazil text on both the sleeve and disc. Some copies of the Brazilian Microservice 2nd pressing were Marketed under the Warner Music Best Sellers brand and come with an additional square blue and white "BE$T SELLERS" logo featuring a yellow triangular background which has been printed directly onto the front cover. The inside of the insert also comes with an extra folded page to include a list of all the albums which were made available in this series by different artists, there is also an advert inside displaying a much larger image of the "BE$T SELLERS" logo this time on a pale yellow background to include the "WARNER MUSIC" logo at the top and "CD . LP . K7" at the bottom. There was also gold stamped issue of the Microservice Brazilian CD which was used for promotional purposes. It is the regular release but with a circular gold stamp on the back sleeve. "Videolar": Similar to the second "Microservice" release with the same catalogue number M925 300-2 but comes with some different Record Company information; "http://www.warnermusicbrazil.com.br Warner Music Brasil Ltda. – Fabricado na Zona Franca de Manaus por Videolar Multimidia Ltda. – Av. Solimoes, 505 Distrito Industrial C G C 22.797.096/0001-01 Industria Brasileira – Distribuido pela Warner Music Brasil Ltda. C G C 42.470.112/0012-09". There is a silver "FLAP F" hologram sticker included on the front of the CD case. The manufacturing text on the disc is printed around the top rim, rather than at the bottom and reads; "FABRICADO POR VIDEOLAR ® - INDUSTRIA BRASILEIRA – SOB LICENCA DE WARNER MUSIC BRASIL LTDA. CGC: 42.470.112/0012-09", plus the CD logo at the bottom is displayed in bold. The second "Videolar" CD pressing was again distributed by "Warner Music Brasil Ltda" and is similar to the earlier "Videolar" release displaying the regular album artworks. On the front of the CD case, it comes instead with a smaller silver "ifpi" hologram sticker rather than the previous "FLAP F" one. The regular folded front insert is also included. On the back sleeve, the white barcode as usual is displayed landscaped in the top right hand corner. Along the bottom, there is some slightly different manufacturing and distributing information shown compared to the earlier "Videolar" release which reads; "Warner Music Brasil Ltda. Uma empresa Warner Music Group. Produzido no Polo Industrial de Manaus por Videolar S.A. – Av. Solimoes, 505 – Distrito Industrial – Manaus – AM – CNPJ04.229.761/0004-13 - Industria Brasileira - Distribuido pela Warner Music Brasil Ltda. CNPJ42.470.0012-09. www.warnermusic.com.br". Additionally included next to the usual "WB Records" and "COMPACT disc DIGITAL AUDIO" logos is a flying amazon bird "PRODUZIDO NO POLO INDUSTRIAL DE MANAUS CONHECA A AMAZONIA" logo. The layout and design of the disc used is exactly the same as the previous "Videolar" pressing, but on the the spine of the CD case and around the centre ring of the actual disc, there is some additional batch issue coding; AB0001000. The Catalogue number M925 300-2 is also the same as before. The third Brazilian "Videolar" made CD which is very similar to the previous releases, but instead comes again with some slightly different Brazilian manufacturing and distribution information on the back cover which reads;- "Warner Music Brasil Ltda. Uma empresa Warner Music Group. Produzido no Polo Industrial de Manaus por Videolar S.A. - Av Solimoes, 505 - Distrito Industrial - Manaus-AM. CNPJ 04.229.761/0004-13 Industria Brasileira, sob encomenda da Warner Music Brasil Ltda. CNPJ 42.470.112/0012-09 Distribuido pela Warner Music Brasil Ltda. CNPJ 42.470.112/0012-09. www.warnermusic.com.br". The usual "WB","COMPACT disc DIGITAL AUDIO" and flying Amazon bird "PRODUZIDO NO POLO INDUSTRIAL DE MANAUS CONHECA A AMAZONIA" logos are also on display. The layout and design of the disc used is exactly the same as the previous "Videolar" pressing, but on the spine of the CD case and around the centre ring of the actual disc, there is some additional batch issue coding, three copies of this 3rd Videolar pressing are known to exist; AC0001000, AD0001000 and AE0000500. "Sonopress": The "Sonopress" album was manufactured and distributed by "Sonopress" under license to "Warner Music Brasil Ltda" It has the same front cover artworks as the earlier Microservice and Videolar Pressings, but display some different manufacturing and distributing information on the back cover "(C) 1985 Warner Bros. Records Inc. Warner Music Brasil Ltda. - uma empresa Warner Music Group. Produzido no Polo Industrial de Manaus e distribuido por Sonopress Rimo Ind, e Com. Fonog. S.A.- Ind. Bras. Rua Ica, no 100-A - Distrito Industrial - Manaus - AM - CNPJ 67.562.884/0004-91. Sob Licenca de Warner Music Brasil Ltda.-CNPJ 42.470.112/0012-09. Todos os direitos reservados. Proibida a reproducao, execucao publica e locacao desautorizadas sob as penas da lei. O prazo de validade do disco CD ou DVD e indeterminado desde que observado os seguintes cuidados: Armazenar em local seco, livre de poeira, nao expor ao sol, nao riscar, nao dobrar, nao engordurar, nao manter a uma temperatura superior a 55oC e umidade acima de 60g/m3 e segurar o disco sempre pela lateral e pelo furo central.DISCO E CULTURA. Denuncie a pirataria: [email protected]". Also included on the back cover are the usual "WB", "COMPACT disc DIGITAL AUDIO" & "Flying Amazon Bird" logos, there is also some additional "Warnermusic" Website Addresses which didn't appear on the Microservice or Videolar Pressings. Some of the fonts are smaller on this release, such as the catalogue number on the sleeve and spine and the record company and copyright information is printed all round the edge of the disc. On the spine of the CD case and around the centre ring of the disc, is the batch issue coding, at least two known copies of this Sonopress Pressing exist;- AF0001000 and AG0001000. The Brazilian LP release comes with a Silver a-ha logo on the front cover, the catalogue number 610.7054 is displayed in the top right hand corner. The back cover is much darker compared to the german pressing showing a more greyish look. The usual "Warner Bros. Records Inc." handwriting along the bottom has been omitted and replaced with some Brazilian Manufacturing and distributing information which reads "FABRICADO E DISTRIBUIDO POR RCA ELETRONICA LTDA. - AV. ENG. BILLINGS, 2227 - S. PAULO - CGC 61.126.074/0002-44 SCDP.DPF.001/69 - S.PAULO - INDUSTRIA BRASILEIRA SOB LICENCA DE WEA DISCOS LTDA". At the top right hand corner of the back cover we have the text "STEREO 36.209 SERIE SUPER LUXO TAMBEM EM CASSETE", which translates to available on cassette and includes the cassette catalogue number 36.209. The label on the record is coloured cream instead of the usual white, plus contains additional lines similar to a note pad. The "Warner Bros. Records" logo is displayed at the top centre with the title A-HA "HUNTING HIGH AND LOW" underneath. Some Brazilian coding C.G.C. 56.697.162/0002-66 is displayed on the left hand side, whilst the Catalogue number 610.7054 on the right hand side. On the lower half of the label, we have the full track listing with each track having it's own unique 8 digit number, some track and production credits are also included. Displayed along the bottom outer edge of the label is some Brazilian Manufacturing and Distributing information "Fabricado e distribuido por RCA/ARIOLA INTERNATIONAL DISCOS LTDA. - Av. Eng. Billings, 2227 - C.G.C. 56.697.162/0002-66 - SP - Todas os direitos reservados Ind. Brasileira - WEA DISCOS LTDA. Rua Itaipava, 44 - Jardim BotÃ¢nico - Rio de Janeiro - RJ - C.G.C. 42.470.112/0001-56 - Censuro - Protocolo Geral no 273.". The Brazilian CD album is similar to the European release but has Brazilian text on the back sleeve and disc. The cassette release comes with a black front cover with white text, the usual artworks is displayed in the centre with a white border, the title "A-HA HUNTING HIGH AND LOW" is shown at the top and the "DOLBY SYSTEM" logo at the bottom left hand corner. Both the spine and back cover is orange, the full track listing is shown on the back cover along with it's own 8 digit number, the usual production information and "Musica e Cultura" is also shown. The spine displays the title "A-HA HUNTING HIGH AND LOW" in the centre, "WB" logo with 6 digit number on the left and both catalogue numbers to the LP and cassette release on the right. The "Dolby-B" is also shown. The first pressed cassette is cream with brown printed text, it was issued by "BMG". The full track listing with credits is shown at the top, some Brazilian record company information is shown at the bottom of side 1, it reads "WEA DISCOS LTDA Rua Italpava, 44 - Rio de Janeiro - RJ CGC 42470112/0001-56 SCDP-SR/GB/DPE 273/76". On side 2 there is instead some Brazilian Manufacturing and Distributing information displayed at the bottom which reads "FABRICADO E DISTRIBUIDO POR RCA ELECTRONICA LTDA. AV. ENG. BILLINGS, 2227 - S. PAULO - CGC61.126.074/0002-44 SOB LICENCA DE WEA DISCOS LTDA". The usual WB logo, Dolby - B and catalogue number 761.7054 is also present. The second pressed cassette is also cream, but comes instead with a grey stick-on label printed with black text. It was also issued by "BMG". The layout and design is otherwise exactly the same as the 1st pressing. The first Canadian CD was distributed by Columbia House and was release by reprise, it comes with a similar sleeve to the European release. The text "Manufactured & Distributed by Columbia House/Distribue par Columbia House, 815 Middlefield Road, Scarborough, Ontario, M1V 3M3" is printed at the bottom on the left hand side of the back sleeve. The disc itself was manufactured by CINRAM. The second Canadian CD album was also release by reprise, it comes with the usual front cover artworks similar to the earlier Columbia House release. On the back cover it displays in uppercase that it was "MANUFACTURED & DISTRIBUTED BY WARNER MUSIC CANADA LTD 3751 VICTORIA PARK AVENUE, SCARBOROUGH, ONTARIO M1W 3Z4". The disc was also Manufactured by CINRAM but the layout and manufacturing information differs compared to the first pressing. The catalogue number has also changed to CD 25300. There is another Canadian reprise released CD Album which was instead Distributed by "WEA Music of Canada Ltd./WEA Musique Du Canada Ltee. 1810 Birchmount Rd., Scarborough, Ontario". It very similar to the second release including using the exact same disc and Catalogue Number. The first Canadian LP release was Manufactured by Columbia House (CRC) Records, it comes with the usual artworks but the Warner Bros. Records Inc. handwriting at the bottom of the back cover has been overdubbed with a plain white strip and re-printed with black text, the Manufacturing information has been printed in bold and reads "Manufactured by Columbia House, a division of CBS Records Canada Ltd./Fabrique par Columbia House, une division de CBS disques Canada Ltee, 815 Middlefields Road, Scarborough, Ontario, M1V 3M3". There is a Barcode shown at the top right hand corner of the back cover and "CRC" at the bottom right hand corner. displayed on the spine is "LITHO IN CANADA" plus an additional Catalogue number 542894. The white label on the record comes with the usual colour "Warner Brothers" logo at the top and the track listing at the bottom, the same Columbia House Manufacturing information again has been displayed around the outer edge. The Catalogue number used on the white record label is W1 25300. The usual inner sleeve displaying the picture of the band members in front of the mirror is included. The first Canadian CD was distributed by Columbia House and was release by reprise, it comes with a similar sleeve to the European release. The text "Manufactured & Distributed by Columbia House/Distribue par Columbia House, 815 Middlefield Road, Scarborough, Ontario, M1V 3M3" is printed at the bottom on the left hand side of the sleeve. The disc itself was manufactured by CINRAM. The second Canadian LP release was instead Manufactured by WEA Music of Canada Ltd. and is very similar to the earlier Columbia House pressing, At the bottom of the back cover it now displays that the LP was "MANUFACTURED AND DISTRIBUTED BY WEA MUSIC OF CANADA LTD/WEA MUSIQUE DU CANADA LTEE 1810 BIRCHMOUNT RD., SCARBOROUGH, ONTARIO A WARNER COMMUNICATIONS COMPANY". The usual barcode has again been included at the top right hand corner of the back cover but the "CRC" text which appeared on the Columbia House release has been ommited from this WEA Music of Canada Ltd. Edition. The design and layout on the actual white label of the record has also been slightly changed compared to the Columbia House release, the same "Warner Brothers" Logo with A-HA and the title "HUNTING HIGH AND LOW" shown underneath is displayed at the top, the track listing with credits included is again displayed on the bottom half but set out in a slightly different layout, the track lengths are also printed in a straight column down the right hand side and the Catalogue number has also been changed to 92 53001. Around the bottom outer edge of the label is the same WEA Music of Canada Manufacturing and Distributing information. The usual inner sleeve has also been included on this second pressing. The first Canadian cassette was Manufactured by Columbia House, the front and back cover is coloured black, the regular artworks is displayed at the top half of the front sleeve with A-HA and the title printed below in white. A "Super C Cassette" symbol and the usual "WB" logo are also included. The back cover displays the full track listing, along with some Copyright and Manufacturing information which reads "Manufactured by Columbia House, a division of CBS Records Canada Ltd. Fabrique par Columbia House, une division de CBS Disques Canada Ltee, 815 Middlefield Road, Scarborough, Ontario, M1V 3M3". 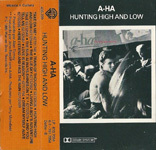 The tape itself is black with white titles, the title "a-ha / HUNTING HIGH AND LOW" with the track listing is displayed at the top, the Columbia House Manufacturing Information is shown at the bottom of each side. The "WB" logo is on the left hand side with "CRC" and either side "1" or "2" underneath. On the right hand side the catalogue number is displayed with the "Dolby HX" logo shown underneath. The catalogue number is W4-25300 (542894C). The second Canadian cassette was Manufactured and Distributed instead by WEA Music of Canada Ltd, it comes with the same front cover artworks to the earlier Columbia House release, but on the back cover it displays that it was Manufactured & Distributed by/Fabrique par WEA Music of Canada Ltd./WEA Musique Du Canada Ltee 1810 Birchmount Rd., Scarborough, Ontario A Warner Communications Company. The tape is again black with white titles, but some the layout including the logos and Manufacturing information differs slightly compared to the earlier Columbia House pressing. The Catalogue Number has also changed to 92 53004. The Chilean cassette release of "Hunting High And Low" comes with the title "Cazando Por Todas Partes". The front cover is white with the usual album artworks printed in the centre with a black border, at the top there is the text "a-ha" printed in pink and "Cazando Por Todas Partes" in purple. The "WB" logo is shown in black near the top right hand corner. Along the bottom there is some Spanish text "FIJATE EN MI - EL SOL SIEMPRE BRILLA EN LA TV CAZANDO POR TODAS PARTES - y otros Exitos." when translated it reads "Take On Me, The Sun Always Shines On TV, Hunting High and Low plus other successes". The first pressing comes with a white spine displaying the title "A-HA CAZANDO POR TODAS PARTES", "WB" logo, catalogue number 195097 and "STEREO". On the back cover which is also white is the full track listing plus some Dolby information all shown in Spanish. The inside of the insert is white with black text, listing all the tracks in both Spanish and English. There is also some Manufacturing and Distributing information which reads "Fabricado y distribuido por EMI Odean Chilena S.A. Santiago - Chile". On the reverse of the spine is some Spanish copyright information along with a "FOTOMECANICA 5551492 GIMO-CROMIA "HERCAL" S.A." logo. The actual cassette is white with a cream label, it displays the title and track listing in Spanish at the top and the some manufacturing, distributing and Spanish copyright information at the bottom. The second pressing is similar to the first pressing apart from the spine is now coloured yellow instead of white, it was again Manufactured and Distributed by "EMI Odeon Chilena S.A.". All of the information including the text and layout on the insert is otherwise exactly the same. The tape is now transparent clear with a grey centre and white printed text, the font size of the title and track listing at the top is some what smaller compared to the first pressing, plus the Manufacturing, Distributing & Copyright information at the bottom has changed to uppercase. The Dolby logo has also now been included on the tape. The third pressing comes again with the exact same insert as the second pressing including having the yellow coloured spine, it again was Manufactured and Distributed by "EMI Odeon Chilena S.A.". The colour of the tape is now tinted with a grey centre, plus the actual layout, detail and font size of the text is exactly the same as the second pressing. The Colombian LP release comes with the same front cover as the European pressing but the title "hunting high and low" is printed in grey text instead of the usual red. On the back sleeve, the usual track listing is shown in English with the Spanish translation printed in uppercase with a different font size alongside. Displayed at the top right hand corner is the "Warner Bros" logo with the Catalogue numbers for both the Colombian LP (6096) & Cassette (7096) release underneath. Along the bottom of the back sleeve we have some Manufacturing information and a "PHILIPS" logo. The actual label on the record is some what different compared to the European pressing, it comes with a white label with printed lines similar to an exercise book. The usual "Warner Bros." logo is displayed at the top along with some Spanish Copyright information which reads "RESERVADOS LOS DERECHOS DE AUTOR-PROHIBIDA LA COPIA, EJECUCION PUBLICA Y LA RADIOTRANSMISION" on the outer top edge. On the lower half of the label is the title "Hunting High and Low A-HA" with the full track listing printed underneath in English uppercase lettering, the Spanish translation is also shown alongside in lowercase lettering. On the outer lower edge, we have some Spanish Manufacturing information which reads "PRODUCIDO POR INDUSTRIAS PHILIPS DE COLOMBIA S.A. BAJO LICENCIA DE WEA INTERNATIONAL INC". The LP comes with the regular front cover artworks but additionally includes a green hi-light under the title and above the artwork picture. In the top right hand corner it displays in white, the "WB Records" logo, catalogue number "L.P.-80079" and "ESTEREO COMPATIBLE". The reverse of the sleeve is coloured light grey, rather than white and shows the usual track listing down the left hand side, including the regular production text, UK a-ha club address and "also being available on cassette". The three pictures of the band members as usual are displayed on the right hand side. There is no barcode or catalogue number shown at the top right hand corner. Along the bottom there is a white strip which has covered up the whole of the regular "Warner Bros. Records" contact address and copyright information to display instead on the left hand side; "DISCO ES CULTURA". Some manufacturing text; "MANUFACTURED POR FEDISCOS DISTRIBUYE ALMACENES DE MUSICA IMPRESO EN GRAFICAS FERAUD P. 1986 GUAYAQUIL - ECUADOR" has been printed on the right hand side along with a round pipe looking logo displaying; "J.D. FERAUD GUZMAN" within. The record itself comes with white lined labels and displays the regular colour "WB Records" logo at the top with the title "HUNTING HIGH AND LOW a-ha" and production text; "Prod. por : Tony Mansfield" underneath. On the left hand side, it shows "p 1985" with "U.S.A." and includes both the US 1-25300 and Ecuador LP-80079-A/B catalogue numbers. The "STEREO" logo is displayed on the right hand side. 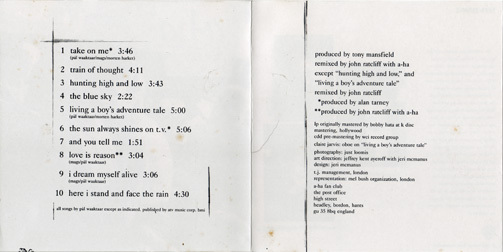 The lower half of the labels include the full track listing to each side, both printed in Engish and Spanish, along with track credits and some production text to "Alan Tarney". The trademark; "a Warner Communications Company ®" is shown at the bottom of each side. Around the outer edge of the labels again on both sides is some Spanish copyright information which reads; "Reservados todos los derechos de los obras grabadas en disco y prohibida su reproduccion, radiodifusion y utilizacion publica". The release doesn't appear to include an inner sleeve. The Ecuador cassette comes in a clear frosted backed case with a white folded paper insert and black printed text. The regular album artworks picture is shown at the top of the front cover with the title; "HUNTING HIGH AND LOW A-ha" and catalogue number "CASS. 80079" displayed underneath. The full track listing is also included at the bottom. The spine comes with the "WB Records" logo displayed landscaped on the left with the title "HUNTING HIGH AND LOW A-ha" in the centre. The catalogue number "CASS. 80079" is shown orientated on the right hand side. On the back cover the full track listing is again shown with side A and side B printed in Spanish to read; "LADO A" and "LADO B". There is also some other Spanish publishing text; "GRAFICAS FERAUD CIA. LTDA." also included. The tape is clear transparent with light green cogs and black printed text, it displays the title "HUNTING HIGH AND LOW A-HA" at the top with the track listing to each side shown underneath. Along the bottom of both sides is some manufacturing information and the catalogue number; "MANUF.POR: FEDISCOS-ECUADOR WARNER 80079 –A/B". The German pressing of the CD is similar to the UK release but has a shortened catalogue number "925 300-2" and doesn't include the French number. The text on the disc has changed from "Made In Germany" to "Manufactured in Germany by Record Service GmbH, Alsdorf". There is a gold edition of the German gold CD album, some copies come with a gold, red and white sticker with the text "Limited Edition. Bild am Sonntag. Gold! WEA". The German LP release is similar to the UK release and also states that it was "Manufactured by Record Service GmbH, Alsdorf in Germany", but it doesn't include the UK catalogue number "WX 30". In the top right hand corner of the back cover, it displays the standard "7599-25300-1" barcode number with the Germany "925 300-1 (U)" and France "WE 381" LP catalogue numbers underneath. Additionally displayed is the catalogue number for the German cassette release "925 300-4". Along the bottom of the back cover, underneath the "Warner Bros. Records Inc." handwriting, is some English and French manufacturing information which reads "Manufactured in Germany by Record Service GmbH, Alsdorf. Presse en Allemagne par Record Service GmbH, Alsdorf a Warner Communications Company". On the label itself it displays the usual colour "Warner Brothers Records" logo at the top with "a-ha HUNTING HIGH AND LOW" underneath. The full track listing along with some production and publishing information "All songs by Pal Waaktaar except as indicated. Produced by Tony Mansfield. Remixed by John Ratcliff with a-ha. Published by: G.B. only) 1-5 ATV Music Ltd. (P) + (C) 1985 Warner Bros. Records Inc. for the U.S. & WEA International Inc. for the world outside of the U.S." is also shown. Displayed on the left hand side is the STEREO and GEMA/BIEM logos with the catalogue number "925 300-1" at the bottom. Around the outer edge of the label is some manufacturing and copyright information which has been printed in all three languages English, French and German, it's exactly the same as the European issue. Also included is the regular inner sleeve which displays the picture of the band members sitting in front of a mirror. The German only catalogue number "925 300-1" is additionally shown in the top right hand corner. A German made special edition of the LP was produced for "Club-Sonderauflage" (the organisation by German Media-Corporation "Bertelsmann"). The LP is similar to the regular release, but the unique catalogue number and "Club-Sonderauflage" is printed in the top right hand corner of the reverse of the sleeve. "Club-Sonderauflage" is also printed on the label. It is thought that this LP might have been pressed for the UK market as the UK catalogue is also printed on the reverse of the sleeve, so too is a circled "U". There is also a "Club-Sonderauflage" German cassette edition which is similar to the European edition and was also "Manufactured in Germany by Record Service GmbH Alsdorf". The release comes with the regular front cover artworks but the layout on the spine and back sleeve is slightly different. The spine comes with a unique catalogue number 33 390-6 and has "CLUB SONDERAUFLAGE" printed in the usual red at the bottom. The "WB RECORDS" is also present but has been displayed orientated rather than landscaped. The back sleeve is similar to some of the European editions which include the extended back cover covering up the whole of the tape, but there is no barcode been added and shows only the track listing for each side printed down the centre. The usual track production information to "Tony Mansfield", "Alan Tarney" and "John Ratcliff" is also included. On the inside of the insert, the regular layout is displayed containing the track production credits, photographic credits to "Just Loomis" and the "a-ha Fan Club address at The Post Office, High Street, Headley, Bordon, Hants, GU35 8BQ England". The "WB Records" logo and contact address is also shown; "Warner Bros. Records Inc. - 3300 Warner Blvd, Burbank, Calif 91510". The regular "Manufactured in Germany by Record Service GmbH Alsdorf - Presse en Allemagne par Record Service GmbH Alsdorf a Warner Communications Company" information is again shown on the reverse of the spine. The tape itself is black with a silver stickered label and black printed text. The layout and design is virtually the same as the European second pressing displaying the regular title; "a-ha / Hunting High And Low" along the top with the track listing to each side underneath. The usual "WB RECORDS" logo is displayed on the left hand side along with the revised catalogue number 33 390-6 and "BIEM/GEMA". On the right hand side, the additional wording "CLUB-SONDERAUSGABE" is shown, along with a large side "1" or "2" and the "DOLBY SYSTEM ®" logo. Along the bottom of side 1 is the same Copyright information which appears on the European edition, whilst along the bottom of side 2, it includes the production text; "Produced by Tony Mansfield. Remixed by John Ratcliff with a-ha ℗ + © 1985 Warner Bros. Records Inc. for the U.S. & WEA International Inc. for the world outside of the U.S.". There is a German (or French?) cassette release of "Hunting High And Low" which comes with a similar insert to the European first pressing, but only includes the German "925 300-4" and France "WE 481" Catalogue numbers printed in red on the actual spine, the usual "UK WX30C" Catalogue number has been omitted. On the inside of the insert on the reverse of spine, the usual "Manufactured in Germany by Record Service Aldorf" information has also been removed. However the actual tape used on this release appears to be just the standard European black tape with grey printed text and displays all three German, UK and France catalogue numbers. There are two West Germany made pressings of "Hunting High And Low". The first pressing comes with a Warner Bros logo printed on the sleeve. Both the back cover & the inside of the front cover insert displays that it was Manufactured & Printed in Hanover, West Germany. The disc itself includes the "Warner Bros Records" logo, it comes with a large silver centre ring and again shows that the CD was "Made in West Germany by PolyGram". The second pressing comes instead with a Reprise logo displayed on the disc, both the back sleeve & front cover insert was printed in the USA rather than West Germany, it's very similar to the US release but has "Warner Bros" printed on the spine in place of Reprise. The Reprise disc also comes with a large silver centre ring & has the additional text "Made In West Germany by Polygram" printed around the bottom rim. The Greek LP of "Hunting High And Low" has a similar front and back cover sleeve to the German manufactured release and displays the same barcode with all three European catalogue numbers at the top right hand corner of the back sleeve. The regular German and French manufacturing information; "Manufactured in Germany by Record Service GmbH. Alsdorf – Presse en Allemagne par Record Service GmbH. Alsdorf a Warner Communications Company" is also printed along the bottom of the back sleeve, it also includes the usual handwritten text; "Warner Bros. Records Inc." Company address details and Copyright information. At the bottom left hand corner, an additional Greek Record Company address has been displayed; "WEA RECORDS S.A. Messogheion 319-HALANDRI Made in Greece". At the bottom right hand corner, there is some other Greek text; "ΕΚΤΥΠΩΣΗ; Μ. ΟΡΦΑΝΟΣ Τ. ΕΚΑΛΤΣΑΣ ΤΗΛ. 2513308" which displays the name and telephone number of the Printing Company. The usual black "WB Records" logo is also included at the bottom right hand side of the back sleeve. The record label is white with black text and displays the usual colour "WB RECORDS" logo at the top of each side with the title "A-HA HUNTING HIGH AND LOW" underneath. On the left hand side, the catalogue number 925300-1 and "STEREO" is shown, whilst on the right hand side, it displays SIDE "1" or "2" and "AEPI". On the lower half of the label, the track listing is displayed in all uppercase lettering with some track credits and track lengths included. Some Production information is also shown; "All songs by Pal Waaktaar except as indicated ATV Music Corp.,BMI (P) 1985 Warner Bros. Records Inc. for the U.S. (C) 1985 Warner Bros. Records Inc. a Warner Communications Company". Around the outer edge of the label on both sides is the usual copyright information and displayed along the bottom is "MADE IN GREECE BY G.P.I.". The inside of the record sleeve comes with an additional lyric sheet. 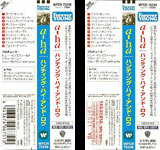 The front and back cover of the cassette is in red, with the "WB" logo and title "A-HA HUNTING HIGH AND LOW" printed in black text, the usual album artworks is displayed in the centre. At the bottom of the front cover, we additionally have the "STEREO" and "DOLBY SYSTEM" logo's. The sleeve folds out single-fold with the tracks listed both on the back cover and on the inside. The back cover also displays that the cassette was "MARKETED AND DISTRIBUTED BY WEA RECORDS S.A., GREECE". The tape itself is light grey with a white stick-on label and black text. The Copyright information on side 1 is displayed in English whilst on side 2 it's shown instead in Greek. Some sealed copies of the cassette additionally come with an offical blue/greyish signed I.F.P.I. anti-piracy seal. 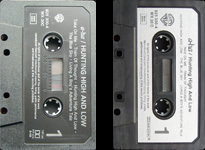 There is another cassette release of "Hunting High And Low" which was circulated around Hungary and is very similar to the Singapore release, it comes with the same white front and back cover insert displaying the regular LP album artwork picture and grey printed text, the usual album artworks are displayed in the centre with the title "A-HA Hunting High And Low" printed at the top and the "Warner Bros. Records" logo at the bottom. On the back cover, it includes the tracks to side one on the left hand side, and the tracks to side 2 on the right hand side. The inside of the insert folds-out single fold, to include the full track listings to each side along with some Production credits and Copyright information. 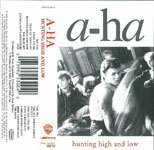 The tape itself is light grey with black printed text and displays the title "A-HA HUNTING HIGH AND LOW" along the top, with the full track listing to each side underneath. The "WB RECORDS" logo is displayed on the left hand side with Side "1" or "2" and Catalogue number 25300-4 on the right. Along the bottom of each side is the same Production and Copyright information which appears on the inside of the insert; "(P) 1985 Warner Bros. Records Inc. for the U.S. (C) 1985 Warner Bros. Records Inc. ALL RIGHTS RESERVED. UNAUTHORISED COPYING PUBLIC PERFORMANCE BROADCASTING OF THIS RECORDING FORBIDDEN". The Indonesian cassette has a single sided white sleeve which folds out and is like the Singapore release. It has the regular LP artwork shot in the centre of the front sleeve with A-HA and the title "Hunting High And Low" printed above in black. Below the artwork is the text "HANYA UNTUK DIJUAL DI INDONESIA" which translates to "ONLY FOR SALE IN INDONESIA" and a "WB RECORDS" logo. On the spine, the title "A-HA Hunting High And Low" is again printed landscaped in the centre with the "WB RECORDS" logo and Indonesian Catalogue number W0101-8 (shown oriented) on the left, with the US Catalogue number 25300-4 to the right. The track listing to each side is displayed in two columns on the back sleeve, plus there is some additional Trade mark information which reads; "Trade mark and recording licensed to PT. Aquarius Musikindo for manufacture and sale in Indonesia only". On the right-hand section of the fold-out insert is the full track listing inclusive of track lengths and track credits. The regular production and remixing information to Tony Mansfield, Alan Tarney and John Ratcliff with a-ha is also shown, plus there is reference to "All Songs by Pal Waaktaar except as indicated ATV Music Corp BMI" and "(P) 1985 Warner Bros. Records Inc. for the U.S. (C) 1985 Warner Bros. Records Inc.". Some Copyright text is also included; "Warning: All rights reserved. Unauthorised copying public performance broadcasting this recording forbidden". There are actual two available pressed tapes which come with the exact same folded insert, but the first pressing comes with a blue tape with white printed text, whilst the second pressing comes instead with a clear/grey transparent tape, again with white printed text. The layout and design on both pressings are otherwise the same; the title "A-HA HUNTING HIGH AND LOW" is shown at the top with the track listing underneath. The "WB RECORDS" logo is included on the left with side "1" or "2", "STEREO" and US Catalogue number 25300-4 on the right. Some production and copyright information are displayed at the bottom of both sides; "℗ & © 1988 Warner Bros. Records, Inc. for the U.S. and WEA International Inc. for the world outside of the U.S. ALL RIGHTS RESERVED. UNAUTHORIZED COPYING PUBLIC PERFORMANCE BROADCASTING OF THIS RECORDING FORBIDDEN"
The first Israel LP was released by "Warner Bros. Records" and comes with a similar front and back sleeve to the UK pressing, there is an additional round white circle on the front cover displaying some hebrew text. At the bottom of the back sleeve is some Manufacturing and distributing information which is printed both in English and Hebrew, it reads "MANUFACTURED AND DISTRIBUTED BY THE GENERAL MUSIC CO. LTD. TEL AVIV., ISRAEL MADE IN ISRAEL מיוצרים ומופץ על ידי שיתוף מוסיקה הכללי. בע"מ. תל אביב., ישראל נעשתה בישראל". The usual barcode shown at the top right hand corner has been omitted and replaced with just the catalogue number BAN 925300-1. The record label itself is white and comes with a large colour "WB Records" logo at the top with the title "A-HA HUNTING HIGH AND LOW" printed all in uppercase underneath, the track listing along with track credits and track lengths is displayed at the lower half of the label, including the regular production text to "Warner Bros. Records Inc.". The usual Manufacturing text around the outer edge has also been replaced with just "Warner Bros. Records inc". The record was made by "ACUM" and includes the usual inner artwork sheet. The second LP pressing was instead released by "Reprise Records" and comes with the same front and back cover sleeve as the "Warner Bros. Records" first release, although the a-ha logo on the front cover has been coloured light green instead of the usual grey colour. The round white circle containing the same hebrew text in the top right hand corner is also included. The record comes with completely different labels compared to the first release. On side 1, it shows a red square label with black text; displaying a large white "Reprise" logo in the centre and "REPRISE RECORDS" in grey at the bottom. The title "A-HA HUNTING HIGH AND LOW" is shown at the top, with Side 1 and "(ACUM)" on the left and the catalogue number BAN 925300-1 and "Stereo-Mono" on the right. The track listing is displayed on the lower half of the label along with track credits and track lengths. There is also some production and copyright text; "All Songs by Pal Waaktaar except as indicated. Produced by Tony Mansfield. (P) & (C) 1985 Warner Bros. Records Inc. for the U.S. & WEA International Inc. for the world Outside of the U.S.". On Side 2, the square label is instead coloured grey with black text, and again displays the white "Reprise" logo in the centre with the "REPRISE RECORDS" also in black additionally at the bottom. The layout is again the same as Side 1 with the title at the top and track listing, production text, and copyright information shown at the lower half of the label. The catalogue number is exactly the same on both releases BAN 92500-1 and the release again comes additionally with the usual inner sheet. The Israel cassette is very similar to the US pressing but comes without any production or record company information on the inside of the folded insert. The colouring of the title "Hunting high and low" on both the front cover and spine, along with the catalogue number & "WB" logo is in pink instead of the usual red. On the back cover, the barcode has been replaced with some manufacturing and distributing information which reads "MANUFACTURED AND DISTRIBUTED BY THE GENERAL MUSIC CO. LTD. TEL AVIV., ISRAEL MADE IN ISRAEL (P) 1985 (C) 1985 תוצךה האךץ ".The actual tape is light grey with blue text, it was made by "ACUM". The title & track listing is displayed at the top & some copyright information is shown at the bottom. all of the text is printed in English. The Italian LP first pressing was released by "Warner Bros." and comes with regular front and back cover artworks, there is no barcode or catalogue number shown in the top right hand corner of the back sleeve, it also additionally shows on the back that it was "Made and Distributed in Italy by WEA S.p.A - Milano A Warner Communications Company". The label on the record is white and displays the usual colour "Warner Bros." logo at the top centre with a-ha and the title "HUNTING HIGH AND LOW" underneath. The full track listing is displayed at the bottom half, along with track lengths and credits. On the left hand side, we have "33 1/3 GIRI STEREO", along with the "S.I.A.E." logo and the Italian round red stamp mark. On the right hand side we have the catalogue number 92 5300-1 and LATO 1. Around the outer edge is some Italian Manufacturing and Copyright information "MADE IN ITALY BY WEA ITALIANA SPA A WARNER COMMUNICATIONS COMPANY. RISERVATI TUTTI I DIRITTI DEL PRODUTTORE FONOGRAFICO E DEL PROPRIETARIO DELL'OPERA REGISTRATA SALVO AUTORIZZAZIONI, SONO VIETARE LA DUPLICAZIONE, LA LOCAZIONE E L'UTILIZZAZIONE DI QUESTO DISCO PER PUBBLICA ESECUZIONE E RADIODIFFUSIONE". The record also comes with the usual insert sleeve displaying a picture of the band members in front of a mirror, although the paper quality is much stiffer compared to the German release. The second Italian LP Pressing was released instead by "Reprise" and comes with the "Reprise" Logo printed onto the actual record label. There are two slightly different copies of the Italian cassette, the first was released by Warner Bros and the second release was by Reprise. Both copies come with the same front cover artworks displayed in the centre on a black background, the title "HUNTING HIGH AND LOW" is shown at the top printed in white. At the bottom we have the "Warner Bros" logo and "Dolby System" again in white. The spine is orange with the title, "WB" logo and catalogue number in black. The back cover is also orange showing the full track listing and some Italian text "Attenzione: avvolgere il nastro fino alla fine prima di girare la cassetta", which translates to Warning: wind the tape to the end before turning the tape. On the inside of the folded insert, there is the full track listing, some Warner Bros record company information and that the cassette was "Made and Distributed in Italy by WEA Italiana S.p.A - Milano". The tape itself is black with orange labels and displays the track listing at the top of each side, there is some Italian manfacturing and copyright information which reads "Riservati tutti I diritti del produttore fonografico e del proprietario dell' opera registrata, Salvo autorizzazioni, sono vietate la duplicazione, la locazione e I' utilizzazione di questo disco per pubblica esecuzione e radiodiffusione. Made in Italy by WEA Italiana spa A Warner Communications Company" displayed at the bottom of each side. The Reprise release is exactly the same as the Warner Bros release but displays an additional "Reprise" logo on the front cover, spine and actual tape. The first Japanese LP press was released by "Warner Brothers" and comes with the regular front and back cover artworks displaying the grey a-ha logo and red "hunting high and low" title along the top of the front sleeve and black and white photo of the band taken in a cafe (by Just Loomis) underneath. The back sleeve comes with the usual layout displaying the track listing down the left hand side on a plain white background, the regular production and photographic credits are included, along with the UK a-ha fan club address details. The three black and white photos of a-ha are displayed on the right hand side with the "Warner Bros." address and Copyright text handwritten along the bottom. There is no barcode included on the black sleeve. The album additionally comes with a silver and white obi-strip with black printed text. Along the top of the front obi is a series of small black squares on the silver background giving a film strip effect, the Catalogue Number P-13153 and price tag ¥2,800 are displayed underneath. The slogan "WE’RE NEW!" is shown above a large landscaped a-ha logo with the title; "Hunting High And Low" printed in both English and Japanese. Another slogan "includes "Take On Me"" is displayed oriented at the end. At the bottom of the front obi is a black strip with some Japanese text in white. Some other small Japanese text is also included in black which refers to the Japanese Cassette PKG-3119 release. The "WB PIONEER" and "WB RECORDS" logos are also present. The reverse of the obi is white with again the black and silver squares making up the film strip along the top. There is a black and white picture of the UK 7" single of "Take On Me" with a large a-ha logo above. The remainder of the text underneath is printed in Japanese and refers to a-ha and "RADIO KID". The inside of the LP comes with a six-page black and white paper booklet displaying the same photos which appear on the front and back of the UK inner sleeve, showing the large picture of a-ha in front of a mirror, with the other side in black displaying the negative version of the same picture. The inside includes more pictures of a-ha including one taken from the cover of the UK 7" single of Take On Me, along with some other Japanese history about the band and all of the track lyrics printed and displayed in both English and Japanese. The record itself comes with off-white labels with black patterned lines and black printed text. The colour "WB RECORDS" logo is displayed at the top with the title; "HUNTING HIGH AND LOW / a-ha" underneath. The "JASPAC" logo, Catalogue number P-13153, including side reference (P-13153-1/2) and 331/3RPM are shown on the left, with SIDE "1" or "2" and "STEREO" on the right. The full track listing to each side is displayed at the lower half of the label and includes the regular Production text; "All songs by Pal Waaktaar except as indicated PRODUCED BY TONY MANSFIELD PRODUCED BY ALAN TARNEY* PRODUCED BY JOHN RATCLIFF with a-ha** ℗ 1985 WEA International Inc. a Warner Communications Company". Around the outer rim of the disc on both sides is some Manufacturing and Copyright Information which reads; "MADE BY WARNER-PIONEER CORPORATION, JAPAN, UNDER LICENSE FROM WARNER BROS. RECORDS INC., U.S.A. ALL RIGHTS OF THE MANUFACTURER AND OF THE OWNER OF THE RECORDED WORK RESERVED. UNAUTHORIZED PULIC PERFORMANCE BROADCASTING AND COPYING OF THIS RECORD PROHIBITED". Some copies of the first pressing of the LP came with a limited poster and 6 page inlay with lyrics. 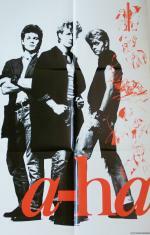 The poster is similar to that which came with the UK 12" releases of "The Sun Always Shines On TV" and "I've Been Losing You" but the band are printed in black and white with a large a-ha logo and 5 cartoons from the Take On Me video are printed in light red on the right hand side. "NOT FOR SALE WARNER-PIONEER CORPORATION" is printed in the bottom right corner. There was a Japanese LP re-issue of "Hunting High And Low" which was released instead by "Reprise Records" and comes with the same front and back cover sleeve as the earlier "Warner Brothers" pressing. The LP also includes a silver and white obi-strip with black printed text which has a layout virtually the same as the previous obi, apart from the slogan at the top has now been changed from "WERE NEW" to "WERE NO.1". The inside of the LP includes the same Japanese six-page black and white paper booklet displaying the regular album artworks, with the lyrics again shown in both English and Japanese. The record itself like the earlier "Warner" Japanese release, comes with an off-white label with black lines and black printed text. The layout and design of it is exactly the same as before to including the regular colour "WB RECORDS" logo at the top, and same font size of the text throughout. An additional square "Reprise Records" logo located on the left hand side above the album title; "HUNTING HIGH AND LOW / a-ha" has been added. The same Catalogue Number P-13153 as before is used. There were two different early pressings of the CD album. The first comes with a red sticker obi strip with white text (catalogue number 32XD-375). The CD also comes with a lyric insert which has lyrics in English and Japanese. The second pressing (10 April 1989 - 18P2-2666) comes with a "Forever Young Series" obi-strip. It comes with the usual folded insert plus a white folded lyric sheet in both English and Japanese plus an advert showing the other a-ha albums available in the series. Hunting High And Low was re-released in Japan as a "Hot Price" album on 25 April 1997. The album has a different catalogue number compared to the first 2 pressings. The obi strip is white with dark green text and the red and yellow "bomb" hot price logo. It comes in a white tray, rather than grey, and the insert includes all the tracks in Japanese and English. The promo edition has a white sticker with red text stuck over the barcode on the back sleeve and the word "SAMPLE" is etched in black around the centre of the disc. There is another Japanese CD release of "Hunting High and Low" which uses the same Catalogue Number (WPCR-1085) as the "Hot Price" release, but comes instead with a plain purple obi-strip with white and purple text. The reverse of the obi-strip displays the release date of 25 April 1997, plus it also features an advert for the "Lifelines" album which was released on the 24 April 2002. The exact same Disc and CD booklet containing the lyrics printed in English and Japanese has been included. There was another reissue on 24 April 2002. The CD is exactly the same as the earlier Hot Price reissue, but it comes with a purple obi-strip with light purple and white text. It includes a shot of the "Lifelines" album cover on the back of the obi. The "Forever Young Series" edition (WPCR-75249) was re-issued 22 November 2006 with slightly different white and blue obi-strip with black, yellow and red text. The CD booklet has lyrics printed in both English and Japanese, so it doesn't come with an additional paper lyric sheet. The promotional version has a usual white promo sticker with red text stuck over the barcode of the obi plus "SAMPLE LOANED" etched into the centre of the disc in orange. There was a more recent "Forever Young Series" CD edition (WPCR-78001) which was re-issued on the 24 July 2013, it now comes instead with a red obi-strip with white, yellow and blue text. Although the actual spine of the CD case displays the Catalogue Number (WPCR-75249) from the previous release of the album. There is also a round red and white "Forever YOUNG THE RED SALE 1CD ¥1,380" sticker on the front of the CD case. The CD booklet has again been included & contains the lyrics printed both in English and Japanese. The German made European CD (7599-25300-2 FRANCE WE 835) was also made available in Japan, but comes additionally with a white obi-strip with black, blue and yellow text. There is a rectangular logo at the top front section of the obi displaying the wording "TSUTAYA" in yellow text on a navy blue background. The obi also displays both the title and other information coloured black in Japanese. The regular Japanese cassette release comes in a white backed cassette case with a long wrap-around sleeve. The front (and the left spine) is red with a small shot of the album cover at the top. Titles are printed in pink and white below. The rest of the sleeve is white with titles in black and blue. There is a small shot of the cover artwork on the right hand spine. The cassette is white with black stickered labels with white text, additionally included inside is a grey paper folded sheet with black text, it contains all of the full track lyrics both in English on one side and Japanese on the other. There was a promo cassette in Japan. The cover is similar to the regular release, but the cover shot is printed with a grey border over a grey and white background. The a-ha logo is printed in purple underneath the picture and also on the spine of the cassette. The "First Single" is litsed as "Take On Me" on the back part of the insert. The cover states that it is not for sale. The cassette itself is white with black stickers and white text. Printed at the bottom of the cassette label it states that the cassette is for "promotional use only in stores (not for sale)"
The Korean CD was Manufactured by "SKC Limited, Korea" & is similar to the European release, it displays the "SKC" logo on the back sleeve and a white "SKC" logo with a pink background on one of the spines. The catalogue number has also been changed. The front cover of the Korean LP is printed much darker than the UK edition, but still displaying the regular album artworks. The a-ha logo is coloured charcoal rather than light grey along the top, with the title "hunting high and low" printed instead in dark red alongside. At the top right-hand corner, the front sleeve artwork has been printed to give an artist’s impression of a torn paper strip in order to unveil the additional text; "Including Take On Me" printed in black font. On the reverse of the sleeve, which is coloured white, the usual track listing is printed down the left-hand side with the regular production text, UK a-ha club address and "also being available on cassette". The three pictures of the band members as usual are displayed on the right-hand side. There is no barcode included in the top right-hand corner, but instead displays the Korean Catalogue number OWL-365 in the space provide, with the additional U.S. number 25300-1 printed underneath in brackets. At the lower right-hand side of the back sleeve under the three pictures of the band members, it includes a three-section strip box to include some tiny Korean text in the first, the "OASIS RECORDS" and "wea" logos in the second, and that the album was "MANUFACTURED BY OASIS RECORD CO." in the third. There is also some additional manufacturing information shown; "Manufactured by Oasis Record Co. under license from WEA Int Approved by the K. E. C. P. P. Ministry of Culture and information Registration No. 16" and that the album was; "Printed in Korea". Along the bottom of the sleeve is the regular handwritten "Warner Bros. Records Inc." contact address details and copyright information. The usual "WB RECORDS" logo is also present. The inside of the album includes a black and white lyric sheet rather than an inner sleeve. The sheet includes a square border printed on each side with four additional shaped corners. One side of the sheet contains the title; "A-HA/HUNTING HIGH AND LOW" displayed along the top, with a picture of the front sleeve located underneath. The band name aha has been split up to include the letter "a" on the left of the front sleeve picture with "ha" on the right. There is also some large Korean lettering printed underneath possibly the album title? translated into Korean. The remainder of the sheet contains some history of A-ha including their hits singles (again all printed and shown in Korean). The album track listing is also included along the bottom to each side. On the reverse of the inner sheet it contains all the song words to each track printed in English. The record itself is housed in a clear polyethene sleeve advertising several record company logos including the "wea" along the top, "WARNER BROS", "ELEKTRA ATLANTIC" and "BUDDAH" on the left, "MCA", "REPRISE", "ATCO" and "ISLAND" on the right, plus the "OASIS RECORDS" logo along the bottom. The labels on the record are white displaying the colour "WB RECORDS" logo along the top, with a-ha and the album title; "HUNTING HIGH AND LOW" printed in black underneath. The regular production text; "PRODUCED BY TONY MANSFIELD *PRODUCED BY ALAN TARNEY" is also shown. On the left-hand side, there is a large number "1" or "2" with the Korean OLW-365 and U.S. (25300-1) Catalogue numbers printed on the right. The full track listing to each side is displayed at the lower half of the label including track credits and track lengths. The regular record company production and copyright text; "All songs by Pal Waaktaar except as indicated. ATV Music Corp. BMI © 1985 Warner Bros. Records Inc. ℗ 1985 Warner Bros. Records Inc for the U. S." is also shown. There is some additional coding; "8509 -L5645 – L5649" and Korean production information included; "℗ Oct. 20. 1985 OASIS WEA KOREA 85-886 (85. 9. 30) W 125gr And Over". Around the outer rim of each side of the label is the same manufacturing information which is printed on the back sleeve. There is also an LP with a green toned sleeve which is thought to be an unofficial release. The Korean cassette release of "Hunting High And Low" comes in a slipcase. The front and back cover is grey with the regular LP cover artwork printed on the front with the A-HA logo in burgundy and the black title "HUNTING HIGH AND LOW" above. Along the top is a light blue strip advertising the tracks "Take On Me" and "Love Is Reason" in yellow, plus a red circle with gold edging displaying the text "Golden Hit" in white. A black "WB RECORDS" logo is included along the bottom. On the reverse of the sleeve, it also includes the same light blue strip, again advertising the same two tracks along the top, but without the "Golden Hit" circular logo. Displayed down the left hand side of the back sleeve is a large white "A" and "B" with the full track listing in black and shown both in English and Korean. Along the bottom, it contains the album release date information; "85-886 (85. 9. 30)" and a Production date; "℗ Oct. 20. 1985". There is also some Manufacturing information included; "Manufactured by Oasis Records Co. under license from WEA Int. Approved by K.E.C.P.P. Ministry of Culture and Information Registration No. 16." and that the album was "Printed in Korea". On each side of the spines of the slipcase, the Catalogue number OWT-440 is printed at the top, along with a yellow "STEREO" logo and a mini picture of Morten. One spine has A-HA with the title "HUNTING HIGH AND LOW" printed in English using the same colour format as the front cover, whilst the other side has it translated into Korean. At the bottom of the English titled side, it includes a black and grey "wea" logo, whilst on the other side; it has been replaced by a black and grey "OASIS RECORDS" logo. There appear to be at least two slightly different pressings of the cassette album which come with a different layout and variation to the actual tapes, but both are housed in the usual standard clear and black plastic case within each card slipcase. The first pressed tape is coloured light grey with a pale green stickered label, displaying black printed text. Along the top of each side is the title; "A-HA / HUNTING HIGH AND LOW" and the full track listing printed in black. There is a thick double red line on the left hand side of the label, on which the Catalogue number OWT-365 and both "wea" and "OASIS RECORDS" logos are shown in black. On the right hand side, it instead displays either side "1" or "2". Along the bottom of the labels on each side, again shown in black, is the same Manufacturing and Printing information which appears on the back of the slipcase. The second pressing comes instead with a beige coloured tape with a red, grey and white stickered label, displaying a mixture of black, white and red printed text. The layout differs slightly compared to the earlier pressed tape. The title; "A-HA/HUNTING HIGH AND LOW" and full track listing to each side is displayed in black on a white background again along the top of each side. The lower half of each side has a grey background and is separated with a thick red line. On the left hand side of the label is the usual "wea" and "OASIS RECORDS" logos in white, whilst on the right, again in white, is the Catalogue number OWT-365, Side "1" or "2" and the "DOLBY STEREO" symbol. Along the bottom of each side of the tape printed in red and enclosed within two thinner white lines, is the same Manufacturing and Printing information which appears on the back of the slipcase and on the earlier pressed tape; "Manufactured by Oasis Records Co. under license from WEA Int’l. Approved by K.E.C.P.P. Ministry of Culture and Information. Registration No. 16. Printed in Korea"
The Malaysian cassette release comes with the same folded insert as the US Warner Brothers release, although it has a more paper feel to it, displayed on the inside of the insert at the very bottom left hand corner is some additional Malaysian Record Company and Printing information which reads "WEA RECORDS SDN BHD 17 Jln 1/57A, Jln Ipoh, K.L. Printed by Culture Press Sdn Bhd 3, Jln 51/201, P.J.". 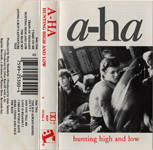 The first pressing comes with a white tape with a cream stick-on label and black printed text, the title "A-HA/HUNTING HIGH AND LOW" is displayed at the top with the track listing underneath, the same Copyright information is displayed at the bottom of each side, the usual "WB" logo and catalogue number is also included. The cassette comes additionally in a white coloured backed case with the "wea" logo engraved into the plastic. The second pressing comes instead with a grey coloured tape with a white stick-on label and black printed text, the design and layout is the same as the first pressing, the cassette case comes instead with a grey coloured backed case with the Warner Music Europe logo again engraved into the plastic. Some copies come with an additional "WEA" white rectangular sticker on the back of the cassette case giving information on how to check that the copy is genuine, it displays both the information in English and Malaysian. The WEA Record Company contact address is also displayed "WEA RECORDS SDN BHD 9th Floor, MUI Plaza Jalan P, Ramlee 50250 Kuala Lumpur, Malaysia". The LP has a similar cover to the European release, but Spanish translated titles are handwitten in brackets after the English titles. The a-ha logo on the cover is printed in silver with the catalogue number LWB-6412 displayed in black in the top right hand corner. At the bottom of the back sleeve, the usual Manufacturing and Copyright information has been over-written in spanish to read "MUY IMPORTANTE : ESTE FONOGRAMA ES UNA OBRA INTELECTUAL PROTEGIDA EN FAVOR DE SU PRODUCTOR (P) 1985 WARNER BROS. RECS. INC. PARA LOS E.U. DERECHOS PROTEGIDOS (c) 1985 WARNER BROS. RECORDS INC. LA TITUIARIDSS DE LOS DERECHOS CENTE DOS EN ESTE FORDERASS SE ENCUENTRA RECONOCIDA Y PROTEGIDO CONFORNE A LA LEY. SE PROHIBE SU REPRODUCCION PARCIAL TOTAL SU ELOUILER Y SU ELEAUCION PUBLICA ESTAS PROHIBICIONES ESTAN PENADAS CONFORME A LOS ARTICULOS 386 DEL CEDIGO PENN Y 135 Y 136 DE LEY FEDERAL SOBRE EL DERECHO DE AUTOR Y DEMO'S NORMSS LEGA LES APLICABLES, VIGENTES", the usual text "also available on cassette" has been typed over in Spanish to show "disponible tambien en cassette". Some other information "MIEMBRO ACTIVO DE AMPROFON (Asociacion Mexicana de Productos de Fonogramas, A.C.)" and "EL DISCO ES CULTURA" is also included. On the record label itself, the usual coloured "Warner Bros." logo is shown at the top with the title "A-HA HUNTING HIGH AND LOW" underneath, the full track listing is also displayed in English and Spanish. Around the bottom edge of the label on side 1, we have some Spanish Copyright information "PROHIBIDA LA REPRODUCCION Y LA RADIODIFUSION DE ESTE DISCO RESERVADOS TODOS LOS DERECHOS DEL PRODUCTOR FONOGRAFICO", wilst on Side 2, we have some Manufacturing information "HECHO EN MEXICO, D.F. POR PRODUCCIONES WEA, S.A. DE C.V. UNA COMPANIA DEL GRUPO WARNERS COMMUNICATIONS". The Mexican cassette release comes with a black front and back cover with white text, the usual album artworks is displayed at the top half of the front cover, with the title "A-HA HUNTING HIGH AND LOW" underneath in the centre, at the bottom left hand corner we have the "DOLBY SYSTEM" logo, whilst the "WB" logo and catalogue number CSWB-6412 is shown at the bottom right hand corner. The back cover displays the full track listing both in Spanish and English, there is also some Manufacturing and Record Company information with reads "Hecho en Mexico por PRODUCCIONES WEA S.A. De C.V., Aca pulco No. 37 Mexico 06140 Tel. 553-6688 una compania del grupo WARNER COMMUNICATIONS MARCA REGISTRADA". The inside of the insert is white with black text, the full track listing with some additional Spanish production information is displayed. The same Manufacturing and Record Company information is also included from the back cover. There is also some strict Spanish Copyright information which reads;- "MUY IMPORTANTE: Este fonograma es una obra intelectual protegida en favor de su productor (P)1985 WARNER BROS. RECORDS INC. PARA LOS E.U. Derechos Protegidos (C)1985 WARNER BROS. RECORDS INC. La titularidad de los Derechos contenidos en este fonograma se encuentra reconocida y protegida CONFORME A LA LEY SE PROHIBE SU COPIA O REPRODUCCION PARCIAL O TOTAL, SU ALQUILER Y SU EJECUCION PUBLICA Estas prohibiciones estan penadas conforme a los Articulos 386 del Codigo Penal y 135 y 136 de la Ley Federal sobre el Derecho de Autor y demas normas legales aplicables vigentes. UN PRODUCTO wea". The first pressing comes with a white tape with black printed text, the title "A-HA HUNTING HIGH AND LOW" is shown at the top with the track listing underneath in Spanish. Some Manufacturing and Production information on side 1 is shown at the bottom "P y C 1985 Warner Bros. Records Inc. UNA COMPANIA DEL GRUPO WARNER COMMUNICATIONS HECHO EN MEXICO", whilst on side 2 at the bottom we have come Copyright information "EL IMPORTE PAGADO POR ESTE FONOGRAMA NO AUTORIZA SU EJECUCION PUBLICA CON FINES DE LUCRO". The "WB" logo with "WARNER BROS." text is printed on the left hand side and the catalogue number CSWB 6412 on the right hand side. The second pressing comes instead with a grey coloured tape with a white stick-on label, the layout and font size of the title and Spanish track listing at the top has been changed, the exact same Manufacturing and Production information is shown at the bottom of side 1, but again has a slightly different layout and font size, the Copyright information on side 2 does the same. One other noticeable difference is that this second pressing does Not include the "WARNER BROS." text underneath the "WB" logo. The catalogue number on both pressings is exactly the same. The New Zealand LP release is similar to the regular US pressing but the a-ha logo on the front cover has now been coloured light grey, on the back cover there is no barcode number but instead displays the Catalogue number for both the LP and Cassette album releases, the bottom right hand corner also shows that it was "Marketed by WEA Record & Tape Distributors Pty Limited. A Warner Communications Company P.O. Box 2915, Auckland, New Zealand". The label on the actual record is white and comes with a different layout and design compared to the US release, it also displays at the bottom that it was "Manufactured and Distributed by WEA Records Limited a Warner Communications Company". The usual insert displaying "warner bros. records inc. made in u.s.a" has also been included, but has instead been made from cardboard rather than paper. The front and back cover of the cassette is yellow, the title "A-HA" is printed at the top in large green letters with "HUNTING HIGH AND LOW" displayed in red underneath. The regular album artworks is also included. The sleeve folds out single-fold with the tracks listed both on the back cover and on the inside. The inside also displays that the cassette was "Marketed by WEA Record P.O. Box 2915, Auckland, New Zealand". The tape is white with a white stick-on label. The LP release in Peru comes with an additional red rectangular printed text box advertising the hit singles on the album in Spanish; "CONTIENE LOS TEMAS: "TAKE ON ME" Y "THE SUN ALWAYS SHINES ON T.V."". The title a-ha is printed in grey but additionally includes a red shadowed background. On the back cover there is no barcode included, but instead shown at the top right hand corner is the Catalogue numbers for both the Peruvian LP; "Y-WBR-0253001.1" and Cassette; "Z-WBR-0253001.5" release, along with the word STEREO. At the bottom there is some Spanish Manufacturing information printed in black text which reads "FABRICADO POR "EL VIRREY" INDUSTRIAS MUSICALES S.A. EL DISCO ES CULTURA". Also displayed is some piracy information which includes an image of cassette tape with crossbones and some Spanish text;- "PIRATERIA FONOGRAFICA LA COPIA DE ESTE FONOGRAMA CONSTITUYE DELITO DE ESTAFA, PENADO CON PRISION DE HASTA 6 ANOS (LEY No 23535)". The label on the record is coloured reddish (rather than white) with printed lines, it displays all the track listing in both Spanish and English, along with credits and track lengths, the usual information "All songs by Pal Waaktaar except as indicated" displayed under the full track listing has also been printed in Spanish to read "(Todas Las Canciones Escritas Por Pal Waaktaar, Excepto Las Indicadas)". Around the outer rim of the label is some Manufacturing information which is similar to that shown on the back sleeve; "MANUFACTURADO POR "EL VIRREY" INDUSTRIAS MUSICALES S.A. INDUSTRIA PERUANA REG. IND. 12428", plus there is also some additional Spanish Copyright information;- "RESERVADOS TODOS LOS DERECHOS DEL PRODUCTOR FONOGRAFICO Y DEL PROPIETARIO DE LA OBRA REGISTRADA - PROHIBIDA LA REPRODUCCION EJECUCION PUBLICA Y RADIO TELEDIFUSION DE ESTE DISCO". The release doesn't include an inner sleeve. The Peruvian cassette release comes with a white fold-out insert with the usual album artworks displayed in the centre of the front cover, the catalogue number; "Z-WBR 0253001.5", "a-ha" and "WB" logo are shown in black at the top with the title "HUNTING HIGH AND LOW" printed in red uppercase lettering underneath. There appears to be at least two slightly different pressings of the cassette as some copies come with a larger font size on the actual title. There is some Spanish manufacturing information "FABRICADO POR "EL VIRREY" INDUSTRIAS USICALES S.A. R.I. 12428" printed in black at the bottom. On the spine, the title and a-ha logo are printed landscape in black with the "WB" logo shown orientated at the top and the catalogue number at the bottom. The full track listing is shown all in Spanish on the back cover, along with side 1 and side 2 which are displayed as "LADO: 1" and "LADO: 2". The right hand fold-out sleeve comes with the title again printed at the top in black with a-ha underneath, the full track listing is shown in both Spanish and English along with track credits and track lengths. Along the bottom, there is a picture of a cassette tape with crossbones displaying some Spanish Copyright Warning information; "PIRATERIA FONOGRAFICA LA COPIA DE ESTE FONOGRAMA CONSTITUYE DELITO DE ESTAFA, PENADO CON PRISION DE HASTA 6 ANOS (LEY Nº 23535)". The actual tape is clear with an bright orange stickered label and black text. The title is displayed in capitals at the top and the manufacturing information printed in Spanish is shown at the bottom; "QUEDAN RESERVADOS TODOS LOS DERECHOS DEL AUTOR Y DEL PRODUCTOR DE FONOGRAMAS ESTA PROHIBIDA LA COPIA, LOCACION Y EJECUCION PUBLICA DE ESTE FONOGRAMA. MANUFACTURADO POR "EL VIRREY" INDUSTRIAS MUSICALES S.A. - INDUSTRIA PERUANA - R.I. 12428". The catalogue number is also included on the left hand side, with side 1/2 and "STEREO" on the right hand side. The LP has a white boxed "Includes Take On Me" advert on the front cover and PARI-MEMBER approved sign on the labels and box cover. It doesn't come with inserts. The first pressed cassette comes with a peach coloured tape with an orange stickered label and black printed text, the track listing and "DOLBY SYSTEM" logo is printed along the top, with the title "HUNTING HIGH AND LOW a-ha" located at the bottom, the "PARI-MEMBER APPROVED" symbol is displayed on the left and catalogue number MS-1-25300 and "STEREO" on the right. The cassette comes with a white insert displaying a picture of the regular LP album artwork at the top half of the front cover. There is a small white text box contained within displaying the information "Includes "Take On Me"" in the top right hand corner. The lower half of the front cover comes with the full track listing to each side printed in uppercase black lettering. Along the bottom, also shown in black is the Catalogue number M5-1-25300, "DOLBY SYSTEM" logo, "PARI MEMBER APPROVED" symbol and "WB RECORDS" logo. On the spine, the "WB RECORDS" logo is included at the top in black, with the "DOLBY SYSTEM" logo, Catalogue number and "STEREO" again in black at the bottom. The title "HUNTING HIGH AND LOW" is in red displayed landscaped in the centre with a large black "a-ha" logo underneath. 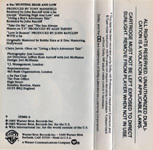 The back sleeve is white with black text, the "WB RECORDS" logo is included on the left hand side with the full track listing to side "one" and side "two" down the centre and on the right hand side. Some Manufacturing information is included along the bottom; "MANUFACTURED IN THE PHILIPPINES FOR WEA RECORDS UNDER LICENSE FROM WEA INTERNATIONAL INC. U.S.A. A WARNER COMMUNICATIONS COMPANY". The inside of the insert displays the title "HUNTING HIGH AND LOW" in black with a large "a-ha" logo underneath. The full track listing to each side is also shown which includes track credits and track lengths. Some further Production credits to Tony Mansfield, Alan Tarney and John Ratcliff is present along with some Dolby trademark text; "’Dolby’ and the double-D symbol are trademarks of Dolby Laboratories Inc". On the reverse of the spine, there is some further reference to "Dolby" and includes some information on the care for your cassette; "This stereo tape gives mono reproduction when playing on mono equipment. It has been recorded with the DOLBY B-type noise reduction characteristic. During playback, set Dolby NR switch ON. Without Dolby NR, adjust treble control if necessary. As the playing times of the two sides are unequal, it is advisable to wind the tape on to the end before turning it over". There is some Copyright information; "ALL RIGHTS OF THE RECORDING COMPANY AND OF THE OWNER OF THE RECORDED WORK RESERVED. UNAUTHORIZED PUBLIC PERFORMANCE, BROADCASTING AND COPYING OF THIS TAPE RECORD PROHIBITED." and a large "WB RECORDS" logo included on the inside of the back cover. There is a second pressing of the album, which comes instead with a grey coloured tape, again with the same orange stickered label and black printed text. The layout and design of it is otherwise the same as the first pressed cassette and includes the same insert as before. There is another Philippine cassette pressing of "A-ha Hunting High & Low" that comes with a slightly different layout and design compared to the earlier editions. It also contains a different Catalogue number M5-1-29375. On the front sleeve, the regular LP album artwork picture is displayed at the top but without the text "Includes "Take On Me"" printed in the top right hand corner. The lower half of the front sleeve is bright yellow with black printed text. The regular full track listing is included, but has now been printed in lower case lettering rather than uppercase. Along the bottom is the revised Catalogue number M5-1-29375, "PARI MEMBER APPROVED" symbol and "WB RECORDS" logo, plus the "DOLBY SYSTEM" symbol that was present on the earlier editions. The spine is also coloured yellow with the black "WB RECORDS" logo displayed orientated at the top and "DOLBY SYSTEM" symbol, Catalogue number and "STEREO" at the bottom. The design and layout of the title has changed compared to the earlier editions, it has again been printed landscape to include the more standard "a-ha" logo in black with a red lowercase "hunting high and low" alongside. On the back sleeve, which again has a yellow background with black text, it contains the "WB RECORDS" logo on the left, with the track listing to each side listed in two columns and printed again in lowercase. The same Manufacturing information that appears on the earlier editions is included along the bottom; "MANUFACTURED IN THE PHILIPPINES FOR WEA RECORDS UNDER LICENSE FROM WEA INTERNATIONAL INC. U.S.A. A WARNER COMMUNICATIONS COMPANY". The actual tape itself is black with a grey stickered label and black text. The "DOLBY SYSTEM ®" symbol is located in the top left hand corner with the full track listing to each side listed instead in column form rather than landscape to include some track numbers. The regular "WB RECORDS" logo is included at the top right. On the left hand side, the "PARI MEMBER APPROVED" symbol is present with Side "1" or "2" and Catalogue number M5-129375 shown on the middle right. 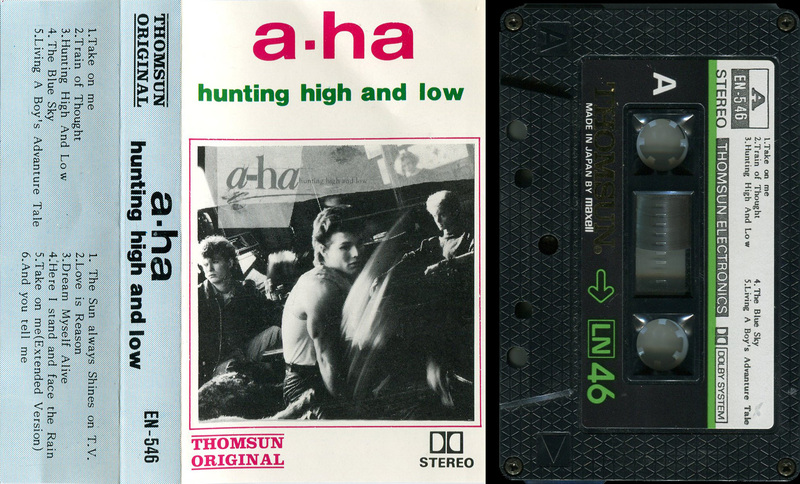 Along the bottom of the tape on each side is the title "a-ha hunting high and low" with "STEREO" included in the bottom right hand corner. The LP release from Portugal is very similar to the Germany made UK release, on the back sleeve under the barcode, the Catalogue number has been changed to 1590011, it also displays the word "(N) STEREO", plus there is a small red and white rectangular "Warner Music" logo sticker. At the bottom left hand side above the regular "Warner Bros. Records" handwriting text, we have shown that the LP was "MANUFACTURED & DISTRIBUTED IN PORTUGAL BY EMI VALENTIM DE CARVALHO MUSICA LDA. ", it also includes the regular WB Records logo and an additional "G))" symbol with the text; "execucao Grafica Monumental" at the very bottom right, which refers to where the LP was Printed. The inner sleeve of the LP comes with a higher quality glossy paper sleeve rather than the regular thin one, the revised Catalogue number 1590011 is also shown. On the record itself, it comes with a similar layout to the German pressing displaying the colour "WB Records" logo at the top with a-ha printed in black underneath. the Manufacturing and Copyright information around the outer rim of the label is printed in Portuguese; "RESERVADOS TODOS OS DIREITOS DO PRODUTOR FONOGRAFICO E DO PROPRIETARIO DA OBRA GRAVADA PROIBIDOS A DUPLICACAO O ALUGUER E A UTILIZACAO DESTE DISCO PAMA EXECUCAO PUBLICA E RADIODIFUSAO NAO AUTORIZADOS FABRICADO E DISTRIBUIDO EM PORTUGAL POR EMIVALENTIM DE CARVALHO, MUSICA LDA." The cassette release in Portugal comes with a white front cover insert with a red striped banner along the top showing the "Warner Bros." logo and "ESTEREO", it displays the usual album artworks picture in the centre with the title "A-Ha <>" above. Along the bottom there is some recording information which reads "A Computerized GAUSS-TAPE MATIC Cassette Recording". Both the spine and back cover come with a yellow background with some black printed text, On the spine the "Warner Bros". logo is shown at the top, title "A-Ha <>" in the centre and Catalogue number 1590014 plus (N) symbol at the bottom. The full track listing is printed landscaped on the back cover with the Catalogue number and the (N) symbol displayed again underneath. On the inside of insert which is coloured white with black printed text, we have the title at the top with the full track listing displayed underneath, including track credits and production information. Along the bottom we have that the Cassette was "MANUFACTURED AND DISTRIBUTED IN PORTUGAL BY EMI VALENTIM DE CARVALHO MUSICA LDA". The actual tape itself is black with grey printed text, the title A-Ha with the track listing is displayed at the top centre, the catalogue number and "Warner Bros." logo is shown on the upper left hand side, whilst "SPA", Side 1/2 and "ESTEREO" is on the right hand side. Displayed along the bottom of each side is the same Manufacturing and Copyright information which is printed in Portuguese and reads "Reservados todos es direitos do produtor fonografico e da proprietario da obra gravada. Proibidos a duplicaÃ§Ã£o, o aluguer e a utilizaÃ§Ã£o desta cassete para execuÃ§Ã£o publica e radiodifusion ao autorizados. Fabricado por EMI-VALENTIM DE CARVALHO, Musica, Lda". There is a Russian re-issue of "Hunting High And Low" which is similar to the European release, but comes with a slim obi-strip advertising the albums "Scoundrel Days" and "East Of The Sun West Of The Moon". 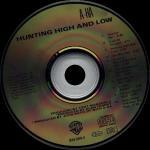 "Hunting High And Low" was re-issued in a card slipcase in 2003, click here for more details. The Russian made cassette of "Hunting High and Low" is similar to the UK release, but the cassette iteslf is transparent with white text. This album wasn't released on cassette in Russia until 2001 and was released by Никитин. The Никитин logo printed on the bottom of the spine and on the cassette. There is also some Russian record company information printed under the track listing. The cassette is transparent with white text. The South Arabian cassette release of "Hunting High And Low" looks rather unofficial; it comes with a white front sleeve with the titles in pink and green at the top and the regular LP album cover artwork in the centre. At the bottom left hand corner it displays a pink "THOMSUN ORIGINAL" logo. The "DOLBY SYSTEM" logo and "STEREO" are additionally shown in black at the bottom right hand corner. The spine and back sleeve is light blue with black text, the "THOMSUN ORIGINAL" logo is displayed landscape on the left hand side of the spine, with the title "a-ha hunting high and low" in the centre and Catalogue number EN-546 on the right. 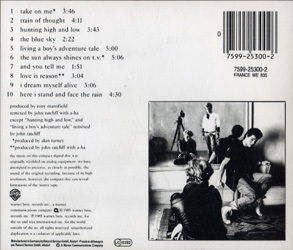 The full track listing is shown on the back sleeve, but some of the tracks being in a different order, the Extended version of "Take On Me taken from the 12" single" has been added as a bonus track after "Here I Stand And Face The Rain", plus "And You Tell Me" is the last track rather than after "The Sun Always Shines On T.V.". The tape itself is coloured black with a black, white and green stickered label; the track listing is printed at the top in black text, along with Side A/B, Catalogue number EN-546, "STEREO", and the "THOMSUN ELECTRONICS" and "DOLBY SYSTEM" logos. Along the bottom, there is a gold "THOMSUN®" trademark logo with some green "→ LN46" text, plus it additionally shows that it was "MADE IN JAPAN BY MAXELL". The cassette release in Singapore comes in a deep blue/grey backed cassette case, the front and back cover is white with black text. The title "A-HA Hunting High And Low" is displayed along the top of the front sleeve with the regular LP album cover artworks located underneath in the centre, the "WB RECORDS" logo is displayed along the bottom. On the spine, the title has again been printed in black and shown landscaped in the centre with the "WB Records" logo on the left and Catalogue number 25300-4 on the right. The back sleeve comes without a barcode, displaying only the full track listing to either side. The inside of the folded insert folds out single sided to include the full track listing including credits and track lengths. The usual Production information to "Tony Mansfield", "John Ratcliff", "a-ha" and "Alan Tarney" is shown, along with some Record Company text; "(P) 1985 Warner Bros. Records Inc. for the U.S. (C) 1985 Warner Bros. Records Inc.". Some Copyright Information; "Warning: All rights reserved. Unauthorised copying public performance broadcasting this recording forbidden" is included at the end. The actual tape is again coloured the same deep blue/grey with black printed text to match the back of the cassette case. The title "A-HA HUNTING HIGH AND LOW" with the track listing underneath to each side is shown at the top. The "WB Records" logo is displayed on the left hand side, with Side "1" or "2" and the Catalogue number 25300-4 shown on the right hand side. There is some additional Production and Copyright information displayed along the bottom of each side; "℗ 1985 Warner Bros. Records Inc. for the US. © 1985 Warner Bros. Records Inc. ALL RIGHTS RESERVED. UNAUTHORISED COPYING PUBLIC PERFORMANCE BROADCASTING OF THIS RECORDING FORBIDDEN". The South African CD is similar to the European release coming with the regular front and back cover artworks, but including a different catalogue number WBXD 73 on the actual spine, back sleeve and disc. On the back sleeve, the barcode in the top right-hand corner has been printed much larger and includes a revised number "6 001491 252927". At the bottom left-hand corner under the regular information regarding the recording of the compact disc, it includes the "Reprise®", "TUSK MUSIC CO. (PTY) LTD" and "A.S.A.M.I SEAL OF APPROVAL" logos in addition to the usual "WB RECORDS" one, but printed slightly smaller than normal. There is also some amendment to the production and copyright information on display; " ℗ 1985 norway. © wea international. marketed & distributed by tusk music co. (pty) ltd. all rights of the producer and of the owner of the work reproduced reserved. unauthorised copying, hiring, lending, public performance and broadcasting of this recording prohibited". The inside of the album includes the usual folded insert displaying the full track listing on the left hand side and production, mastering and a-ha fan club address printed in black on the right hand side. On the back of the insert, the revised South African Catalogue number WBXD 73 and "Reprise®" logo have been included. The disc itself is silver with bold black printed text. 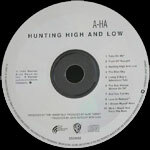 The regular A-HA logo and title "HUNTING HIGH AND LOW" is displayed along with top, with the usual track listing down the right-hand side and production text; "PRODUCED BY TONY MANSFIELD *PRODUCED BY ALAN TARNEY **PRODUCED BY JOHN RATCLIFF WITH A-HA" below the centre ring. On the left-hand side, the "TUSK MUSIC CO. (PTY) LTD" and "A.S.A.M.I SEAL OF APPROVAL" logos are shown separated by some production and copyright information; " ℗ 1985 norway. © wea international. marketed & distributed by tusk music co. (pty) ltd." which appears on the back sleeve. Along the bottom of the disc is the "WB RECORDS", "Reprise®" and "COMPACT disc DIGITAL AUDIO" logos, plus the Catalogue number WBXD 73, "STEREO" and that the disc was "Manufactured by CDT". Some additional copyright information is included around the outer rim of the disc; "ALL RIGHTS OF THE RECORD PRODUCER AND OF THE WORK REPRODUCED RESERVED. COPYING, PUBLIC PERFORMANCE, BROADCASTING AND HIRING OUT DIRECTLY OR INDIRECTLY OF THIS CD IS PROHIBITED". The South African LP cover is slightly duller than the German issue. The a-ha logo is in silver rather than the usual grey. There is no round white sticker included but instead printed actually onto the front cover (below Pål) inside a white coloured circle is the text "Includes the hit singles "TAKE ON ME" and "THE SUN ALWAYS SHINES ON T.V.". The layout of the back sleeve is again very similar to the German edition displaying the regular track listing, production text and A-ha fan club address down the left-hand side, it also includes that the album was "also available on cassette" near the bottom. The three black and white pictures of the band members are included on the right-hand side. At the top right-hand corner, there is no barcode shown but instead displays a different Catalogue number for the "LP WBC 1594" release and was again "Available on Cassette: ZWB 1594". Along the bottom of the back sleeve is the usual "WB RECORDS" logo and handwritten "Warner Bros. Records Inc." address and copyright information which has had some addition marketing and copyright text overdubbed in bold on top of it; "Marketed by WEA Records (Pty.) Ltd. A Warner Communications Company a division of Warner Communications Inc. All Rights Reserved – Unauthorised Duplication is a Violation of Applicable Laws". At the bottom right-hand corner, there is an additional "Interpak" company symbol as to where the album was printed. The inside of the album includes a record with white labels and black printed text. The regular colour "WB RECORDS" logo included at the top with the album title "HUNTING HIGH AND LOW" printed underneath. On the left-hand side, there is some reference to the record company; "EMI Music ℗ 1985 Wea Intl." (1-25300) and includes the US Catalogue number in brackets. On the right, the South African Catalogue number WBC 1594 and side reference (WBC 1594 – A or B) is shown. Below the centre hole on each side is the full track listing including track credits and track lengths. A-Ha and the regular production text; "**Produced by John Ratcliff with A-Ha *Produced by Alan Tarney Produced by Tony Mansfield" is also displayed, plus some record company recording information; "A WARNER BROS. RECORDS INC. RECORDING" and "a Warner Communications Company" logo. Around the outer rim of each side is the regular copyright information around the top; "ALL RIGHTS OF THE MANUFACTURER AND OF THE OWNER OF THE RECORDED WORK RESERVED. UNAUTHORISED PUBLIC PERFORMANCE BROADCASTING AND COPYING OF THIS RECORD PROHIBITED." and some manufacturing and distributing text around the bottom; "Manufactured and distributed by WEA Records (Pty) Ltd. A licensee of WEA International Inc". Unlike the German edition, the LP does not the regular album inner sleeve but instead a plain white inner sleeve displaying aN image of a cassette tape and black text; "HOME TAPING IS KILLING MUSIC AND IT'S ILLEGAL". The cassette release comes with a black and white folded insert with the regular artwork displayed in the centre, it includes a small round circle displaying the text "Includes the hit singles "TAKE ON ME" and "THE SUN ALWAYS SHINES ON T.V."". At the top we have the "wea" and "Warner Bros" logos printed in black on a white striped background, whilst shown at the bottom is the title "HUNTING HIGH AND LOW A-Ha" and "DOLBY SYSTEM" printed in white on a black background, "cassette stereo tape" is also shown but again in black on a white striped background.The spine has a black background with the catalogue number ZWB 1594 being displayed on the left and "wea cassette stereo tape" shown on the right both printed in white. The title is displayed in the centre coloured black on a white striped background. 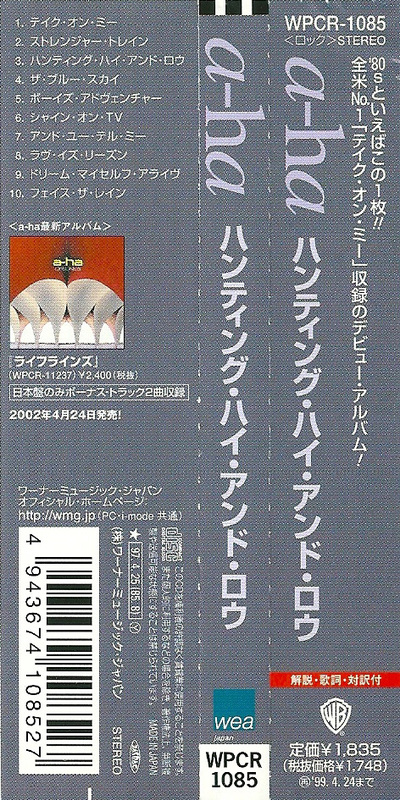 The back cover displays a continuous line of "wea" logos running from left to right, it also contains the full track listing underneath. Inside of the folded insert, we have some record company information which displays that the tape was "Marketed by WEA Records (Pty. )", the full track listing without any lyrics & some Dolby System Information. There are at least two different variations of the actual tape included, one copy comes with a white coloured tape with purple printed text and blue cogs, whilst another tape, again white, comes instead with black printed text and white cogs. Both pressings have the same layout and design to each other. The title "HUNTING HIGH AND LOW" is displayed along the top with A-Ha and some production text; "Ⓟ 1985 Wea Intl." underneath. On the left hand side, it shows "SIDE 1/2" and the "STEREO" logo, whilst on the right hand side; the Catalogue number ZWB 1594 is displayed. Along the bottom of both sides is some Copyright Information which reads; "ALL RIGHTS OF THE RECORD PRODUCER AND OF THE OWNER OF THE WORK REPRODUCED RESERVED. COPYING, PUBLIC PERFORMANCE AND BROADCASTING OF THIS RECORD PROHIBITED". The Spanish LP cover is more of a darker colour than the German made release, although the regular album artwork is still included, showing the black and white photo of the three band members taken in a café (by Just Loomis). The deeper coloured grey a-ha logo and red title "hunting high and low" is displayed as usual in the top left corner. The layout of the back sleeve is again virtually the same as the German edition, showing the regular full track listing printed down the left-hand side in grey. The usual production credits to Tony Mansfield, Alan Tarney and John Ratcliff with a-ha are also included, along with the a-ha fan club address; "the post office high street headley, bordon, hants gu35 8by england" and that the album was "also available on cassette". The three black and white pictures of a-ha are displayed on the right-hand side. In the top right-hand corner, the same barcode "7599-25300-1" as the German edition is included with the Spanish Catalogue numbers for both the LP; L 925300-1 and cassette; M 925300-4 shown. Near the bottom of the back sleeve is the regular handwritten "Warner Bros Records Inc." record company address and copyright text along with the "WB RECORDS" logo displayed in the bottom right-hand corner. Some additional Spanish manufacturing, distributing and printing information; "Edita WEA Records S.A. Condesa de Venadito, 1 - 28027 – Madrid A Warner Communications Company Distribuido por: DISCOS CBS, S.A. Paseo de la Castellana, 93. 20046 Madrid IMPRIME INDUGRAF MADRID, S.A. ALCORCON (MADRID)" has also been included along the bottom of the back sleeve. The labels on the record are white with black printed text. The regular colour "WB RECORDS" logo is displayed at the top, with a small black a-ha logo printed at the upper right of each side. There is also some additional Spanish manufacturing text located under the a-ha logo (but on side one only) which includes a permit number; "FABRICADO EN ESPANA POR POLYGRAM SERVICIOS, S.A. PERMISO No. 6421". The album title "HUNTING HIGH AND LOW" is included above the centre hole on both sides. On the left-hand side, both sides "1" and "2" are listed in Spanish; "Cara 1" or "Cara 2", along with "ESTEREO" and the 33⅓ symbol. On the right, the Catalogue number 92 5300-1 and "SGAE" are shown. At the lower half of the label again on each side is the full track listing including track lengths and track credits. The track "The Blue Sky" is listed as having length 2:32 (compared to 2:22 on the German release). Some additional production text is included below the track listing, but this has been printed mainly in Spanish; "(Pal Waaktaar except donde se indica) Producido por Tony Mansfield (*) Producido por Alan Tarney. ℗ 1985 WEA International Inc. © 1985 Warner Bros. Records, Inc.", there is also a legal deposit reference coding number; "Deposito Legal: M. 29836-1985" (displayed on side 1 only). At the very bottom of the label, it includes a "Warner Communications Company" logo. Around the outer rim of the label on each side is some copyright and record company editing information again all printed in Spanish; "• Reservados todos los derechos • Impuesto de lujo a metalico • Permiso num 7977 • Editado en Espana por WEA Records. S.A. Madrid Barcelona • Prohibida la reproduccion, la ejecucion publica y la radiodifusion de este disco •" The inside of the LP comes with the regular black and white inner sleeve. 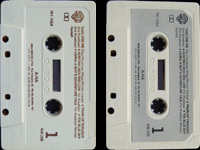 The Spanish cassette release comes with a black front and back cover, the usual album artworks is displayed in the centre with the title "A-Ha HUNTING HIGH AND LOW" printed in white at the top. The "WB" & "DOLBY SYSTEM" logos are also shown. On the back cover we have the full track listing printed in English, with some Spanish Manufacturing information underneath which reads;- "Edita WEA Records S.A. Condesa de Venadito, 1-28027-Madrid A Warner Communications Company Distribuido por DISCOS CBS, S.A. Paseo de la Castellana, 93. 20046 Madrid". On the inside of the insert, we again have the full track listing along with some production credits, there is also some Dolby information printed in Spanish, plus the text "Antes de dar la vuelta a la cinta dejela pasar hasta el final" which translates to;- Wind the tape to the end before turning over. The tape itself is pastel grey with a silver stick-on label, the track listing is shown at the top in English, at the bottom of side A, we have some Spanish Copyright information "Quedan reservados todos los derechos del productor fonografico y del propietano de la obra grabada. Salvo autorizacion, quedan prohibidos la duplicacion, alquiler y prestamo, asi como la utilizacion de esta cinta para la ejecucion publica y radiodifusion". Whilst on side 2 at the bottom we have some Manufacturing and Record Company information "Editado en Espana por WEA Records, S.A. Albacete, 5 - Madrid - 27 a Warner Communications Company Impuesto de Lujo no. 7977. Distribuido por Ariola Eurodisc, S.A. Aragon, 204 Barcelona 1 1 Fabricado por PolyGram Servicios, S.A. (Avda. America, s/n. - Madrid - 27). Permiso no. 6421". The "WB", "S.G.A.E", "STEREO" & "DOLBY SYSTEM" logos are also included on both sides. There is a Switzerland CD release of "Hunting High And Low" which comes with the usual front and back cover artworks. The actual back sleeve was manufactured in West Germany and comes with the text "printed in west germany" shown in the bottom left hand corner. The catalogue number 9 25300-2 is also included. The disc itself was manufactured in Switzerland and comes with a large silver double centre ring. There is some manufacturing information displayed on the left hand side which reads "(P) Warner Bros. Records Inc. A Warner Communications Company All Rights Reserved. Unauthorised duplication is a violation of applicable laws. Made in Switzerland". At the bottom of the disc the catalogue number 9 25300-2, "COMPACT disc DIGITAL AUDIO" and "GEMA" logos are displayed differently compared to the regular German release. Also at the bottom of the inside back cover on the folded insert, it additionally has printed that it was "manufactured in switzerland, printed in west germany". There is another Swiss pressing which includes the same West Germany printed back sleeve and comes with the "Manufactured in Switzerland" disc, but the text at the bottom of the inside back cover of the folded insert now has printed "manufactured in Sweden, printed in west Germany". The catalogue number used is exactly the same as the earlier pressing. The German made European CD (7599-25300-2 FRANCE WE 835) was used for the Taiwan release but comes additionally with a black obi-strip with red and white text. The Taiwan LP has a very similar front sleeve to the European release although slightly darker in colour. The a-ha logo is printed in charcoal at the top left-hand corner with the regular red title "hunting high and low" alongside. There is an additional black Taiwan "UFO wea Warner/Elektra/Atlantic" logo with an orange dot enclosed, located at the top right-hand side. The back sleeve is quite different displaying three different coloured pictures of the individual band members printed at the top half of the sleeve on a plain grey background. The full track listing and other information including the regular production credits and remixing to Tony Mansfield, Alan Tarney and John Ratcliff with a-ha is printed in black below. There is also some reference to the "PHOTOGRAPHY: JUST LOOMIS", "ART DIRECTION: JEFFREY KENT AYEROFF WITH JERI MCMANUS" and "DESIGN: JERI MCMANUS", plus "T.J. MANAGEMENT, LONDON REPRESENTATION: MEL BUSH ORGANIZATION, LONDON" and the A-HA FAN CLUB address. The back of the LP includes that the album was "ALSO AVAILABLE ON CASSETTE". Along the bottom left of the back sleeve, it contains the Catalogue number WU1101R which differs to the European release and the same Taiwan "UFO wea Warner/Elektra/Atlantic" logo, which appears on the front sleeve. It also includes some contact details and that the album was "MADE BY UFO GROUP IN TAIWAN UNDER LICENSE". At the bottom right of the back sleeve, it displays the usual record company production and copyright information; "WARNER BROS. RECORDS INC. A WARNER COMMUNICATIONS COMPANY. © 1985 WARNER BROS. RECORDS INC. (p) 1985 WARNER BROS. RECORDS INC. FOR THE U.S. WEA INTERNATIONAL INC. FOR THE WORLD OUTSIDE OF THE U.S." and the regular "WB RECORDS" logo. The inside of the LP comes with a mini black and white playing card displaying the "UFO" logo and other text in Taiwanese. There is also a 7" sized black and white paper sheet containing some history of a-ha in Taiwanese and the full track lyrics printed in English. 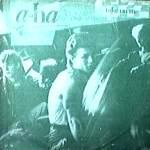 The title "A-HA HUNTING HIGH AND LOW" is printed along the top on one side, with the Catalogue number WU1101 and "UFO" logo included. The same "UFO wea Warner/Elektra/Atlantic" logo and contact details, which is located on the back sleeve, is additionally included along the bottom. The record itself comes with silver labels (rather than the usual white ones) and includes black printed text. There is a plain black "WB RECORDS" logo displayed at the top of each side with the title "A-HA HUNTING HIGH AND LOW" and the Taiwan Catalogue number WU1101R and "UFO wea Warner/Elektra/Atlantic" logo on the left. The US Catalogue number 25300-1 is located to the right. Across the centre hole on each label is a white strip with the word "STEREO" on the left and side "ONE" or "TWO" on the right. The lower half of the labels include the full track listing to each side, along with some similar Warner Bros Records Inc. record company information which is listed on the back sleeve. The same English and Taiwanese manufacturing and copyright information; "MADE BY UFO GROUP IN TAIWAN UNDER LICENSE" is also included. The cassette comes with a silver paper sleeve which wraps around the whole cassette. The front of the sleeve is black with the regular cover artwork at the top and titles in white underneath. The text on the rest of the sleeve is black except for the red A-HA! on the back sleeve with blue Taiwanese text underneath. The inside of the insert is white with the track information plus black and white shot of the band (Morten, Paul, Mags). It comes with a large folded information and English lyric sheet. The cassette is black with white text. It is made by UFO group in Taiwan. The CD release comes with a black obi-strip with red and white text. The Turkish LP of "Hunting High And Low" is like the German made edition displaying the same regular front cover artworks, although the release does not include an additional round white sticker. The reverse of the sleeve is also very similar displaying the regular track listing down the left-hand side and including the same production and photographic credits, plus the a-ha fan club address at The Post Office. High Street, Headley, Bordon, Hants GU35 8BQ England. The pictures of the three a-ha band members are also included on the right-hand side. At the top right-hand corner, the same barcode number "7599-25300-1" as the German edition is shown along with the regular UK, Gernan and France Catalogue numbers; "UK: WX30, 925 300-1 Ⓤ, 925 300-4 and France WE 381". Along the bottom is the usual "WB RECORDS" logo and handwritten Warner Bros. Records Inc. contact address and copyright information. The German made manufacturing text is also shown; "Manufactured in Germany by Record Service GmbH. Alsdorf – Presse en Allemagne par Record Service GmbH. Alsdorf a Warner Communications Company". There is an additional "DÜNYA PLAK" record company round world globe logo and some Turkish address distributing and copyright information printed underneath the pictures on the back sleeve; "Genel Dağıtım: DÜNYA PLAK ve KASETCİLİK LTD. STİ. İMÇ 6. Blok 6321 Unkapani-İstanbul Tel: 526 32 42 Firmamız S.S.Müzik Prodüktörleri Tevzi Kooperatifi üyesidir. Eserlerın mülkıyet ve yapımcı hakları mahfuzdur. Alenen çalınması radyoda yayınlanması ve kopyası kanunlarımıza göre suçtur..." when translated it reads; "General Distribution: WORLD PLATE and CASSETTE LTD. STI. IMC 6. Block 6321 Unkapani-Istanbul Tel: 526 32 42 Our company is a member of the S.S.Music Producers Dispatch Cooperative. The property and producer rights of the works are reserved. The copying and the reproduction of the radio on the radio is a crime according to our laws..." The inside of the album contains a record similar to the German release containing the same white labels with black printed text. The regular colour "WB RECORDS" logo is displayed at the top with a-ha and the title "HUNTING HIGH AND LOW" included underneath. The usual "STEREO" and "GEMA/BIEM" symbols are located on the left-hand side, with "SIDE 1" or "SIDE 2" and an additional "DÜNYA PLAK" logo included on the right-hand side. At the lower half of the labels on each side is the full track listing including track lengths and track credits. The regular production, remixing and record company information that appears on the German edition is included; "All songs by Pal Waaktaar except as indicated. Produced by Tony Mansfield. *Remixed by John Ratcliff. **Produced By Alan Tarney. Published by: (G.B. only) 1-5 ATV Music Ltd. ℗ + © 1985 Warner Bros. Records Inc. (for the U.S. & WEA International Inc. for the world outside of the U.S.". Along the bottom of each side is the Catalogue numbers 925 300-1 and WX30, LC 0392 coding, black triangular 33 RPM symbol and "TÜRK MALI / MADE IN TURKEY". Around the outer top rim of the labels is some Turkish Copyright information which reads; "PLAĞA ALINMIŞ ESERLERE AİT BİLUMUM İMALATÇI VE MÜLKİYET HAKLARI MAHFUZDUR BU PLAĞIN İZİNSİZ OLARAK ALENEN ÇALINMASI, RADYODA YAYINLANMASI VE KOPYASI YASAKTIR". Unlike the German edition, the album does not appear to include an inner sleeve. The Original Turkish Cassette of "Hunting High And Low" was released by World Record Company "DÜNYA PLAK" in Turkey, it displays a cropped landscaped picture displaying the top half only of the regular album cover artworks covering the whole of the front sleeve. The title "hunting high and low" is shown in light grey rather than the usual red, (making it difficult to read). The spine and back sleeve is black. On the spine, the "DÜNYA PLAK" logo is printed orientated at the top in blue displaying an image of the world globe above. The title is displayed landscaped in the centre with "A-HA" in white and "HUNTING HIGH AND LOW" in pink. The "WB RECORDS" logo and Catalogue number 925 300-4 are displayed in white orientated at the bottom, with the word "STEREO" at the end in pink. On the back sleeve the full track listing is printed in white. The inside of the fold-out insert is white with black printed text, it again displays the title "A-HA HUNTING HIGH AND LOW" with the full track listing to both sides underneath. The reverse of the spine contains some Turkish Copyright text which reads; "Alenen çalınmasi ve kopyası yasaktır, Firmamız S.S. Müzik Prodüktörleri Temin Tevzi Kooperatifi üyesidir" when translated it reads "Copying and copying is forbidden. Music Producers is a member of Supply Dispatch Cooperative". The tape itself is clear frosted with an off white stickered label and blue printed text. The title "A-HA HUNTING HIGH AND LOW" is displayed along the top of each side. The "DÜNYA PLAK" World Record Company logo is displayed on the left hand side of the cogs with the "WB RECORDS" logo, Catalogue number 925 300-4 and "STEREO" to the right. Along the bottom of both sides is the Record Company contact details; "IMC 6. Blok 6321 Unkapani – Istanbul Tel: 526 32 42". Additionally engraved into the plastic of the front cover of the cassette case is "RAKS MADE IN TURKEY". The Ukranian release is by Odyssey / Reprise Records and is similar to the European release but with some additional black text, company logos and a silver hologram sticker. There is a small blue and yellow text box printed in the bottom left hand corner of the front sleeve. The disc also has some additional company logos and black Ukranian text. The Uruguay cassette of "Hunting High And Low" comes instead with the album title printed in Spanish "Caza mayor y menor", it includes a white folded insert with a cropped image of the regular album artwork picture placed at the top of the front sleeve with a black border. The artwork does not include the English title at the top, nor the picture of Paul on the right-hand side. a-ha is printed in light blue, with the album title "caza mayor y menor" shown in pink below. Four of the tracks are listed in black and are again printed in Spanish; "TOMALO POR MI", "EL SOL SIEPRE BRILLA", "CAZA MAYOR Y MENOR" and "Y DESPUES CONTAME". There is a bright pink "WB RECORDS" logo on the front and spine, plus "ESTEREO" and the Catalogue number 200014 are in blue. The track listing is shown in black and displayed all in Spanish on the back sleeve and addtionally on the inside of the folded insert, some track credits and track lengths are also included inside, plus some Spanish Production and Record Company text; "Todas las canciones de Pal Waaktaar excepto donde se indica. Prod. Por Tony Mansfield - **Prod. por John Ratcliff con A-HA (P) 1985 Warner Bros. Rec. Inc. para los EE.UU. & WEA Int. Inc. para el resto del mundo". There is also some additional Spanish manufacturing and Record Company information included at the bottom of the back sleeve; "FONOGRAMA ES CULTURA. PRODUCTOR FONOGRAFICO W.E.L.S.A. Made in Uruguay – Art.79 – Ley 13.349 – Imp. FIMASA – D.L. 215.688". The tape is white with a yellow stickered label and black and blue printed text, the title "CAZA MAYOR y MENOR" is shown at the top of each side in Spanish with the full Spanish track listing and A-HA located underneath. On the left-hand side, it displays the catalogue number 200014, "℗ 1985", "AGADU" (twice) and the "WB RECORDS" logo, and on the right-hand side it includes side "1" or "2" ,"STEREO" and the "DOLBY SYSTEM" logo. Along the bottom of each side is some additional Spanish manufacturing, copyright and Dolby trademark information which reads; "Reservados todos los derechos del productor fonografico y de los autores de las obras registradas en esta cinta prohibida su reproduccion, ejecucion publica y/o radio-teledifusion. Industria Uruguaya (Made in Uruguay) "Dolby" y el simbolo doble-D son marcas registradas de Dolby Laboratories Licensing Corporation. Bajo licencia RCA. Productor Fonografico WEL S.A. Fonograma es Cultura. Art. 79. Ley 13349". The USA LP release comes with the exact same front and back cover artworks as the UK release, but there is no catalogue numbers shown underneath the barcode on the back cover, the usual Manufacturing information has also been omitted from the back cover. On the inner sleeve we additional have printed that the Record was "made in u.s.a.", plus the catalogue number is now displayed as 25300-1. The record label itself comes with a slightly different font size and layout compared to the UK release, plus some of the usual Manufacturing and production information is not included. Some copies also come with a green and white checkered sticker on the front cover "features the hit single take on me". There is another USA LP release which was instead Manufactured by "Columbia House", it comes with virtually the same front and back cover sleeve as the regular USA release, but there is no barcode displayed at the top right hand corner of the back sleeve. At the bottom right hand corner of the back sleeve, it additionally shows that it was "Manufactured by Columbia House Under License". The actual label on the record itself is again very similar to the regular release apart from the slightly different layout and font size. The catalogue number has also been changed to W1-25300. The usual inner sleeve has also been included. The CD is available in a long box. There are two different long boxes, the first pressing has the title in black letters where as a later pressing has the title in light green. The regular USA CD edition was released by "Warner Brothers" and is similar to the German pressing, it additionally has shown on the inside front and back cover that it was "printed in usa". The actual disc itself comes with a solid silver centre ring and displays on the left hand side that it was "Made in West Germany by PolyGram".The colour on the insert has been printed much bolder compared to the German release, plus the catalogue number has also been changed to read 9 25300-2. There is a second USA pressing which was also released by "Warner Brothers" and comes with the exact same front and back cover as the regular pressing including displaying that it was "printed in usa". The disc used is some what different compared to the earlier West German PolyGram made disc and comes with a regular clear plastic centre ring, it was instead Manufactured by Discovery Systems and displays on the left hand side that it was "Made in U.S.A by DADC". The catalogue number at the bottom of the disc is also different compared to the earlier West Germany PolyGram pressed disc and now reads 25300-2 DIDX 491. There is also a US "Reprise Records" CD release of "Hunting High and Low" which is similar to both the earlier "Warner Brothers" US pressings, but the Reprise logo replaces the Warner logo on both the actual disc and spine of the CD case. The disc again comes with a regular clear plastic centre ring and now additionally states that it was "MADE IN USA". The disc also displays on the left hand side that it was "Mfg. by WEA Manufacturing". Also the colour on the insert has again been printed bolder compared to the one on the German release. There was another "Reprise Records" release of Hunting High and Low which was re-issued by "Discovery Systems" (instead of WEA Manufacturing), it is very similar to the earlier "Warner Brothers Discovery Systems" edition, but the "WB" logo on the disc has now been replaced instead with a "Reprise" logo. The catalogue number has also been changed to read 9 253002 DIDX 491, plus it also additionally shows underneath the catalogue number that it was "Made in USA". On the left hand side of the disc, the same Manufacturing information which appeared on the "Warner Brothers" edition is displayed showing that it was "Made in USA by DADC". There is US Warner Bros. Columbia House Manufactured CD edition of "Hunting High and Low" which comes with a different Catalogue number W2-25300 compared to the regular German/US release. The regular front cover artworks are used, but on the back sleeve, there is no barcode included in the top right-hand corner, with some different printing and manufacturing information displayed instead at the bottom left; "printed in usa. W2-25300 manufactured by Columbia house under license". On the spine, the title; "a-ha/hunting high and low" is shown landscaped in the centre, with the catalogue number on the left and "warner bros." on the right. The inside of the CD comes with the regular black and white folded insert displaying the full track listings and credits. The reverse of it has the revised Catalogue number displayed at the top W2-25300, with the additional text; "printed in usa" at the bottom. The disc itself comes in two slight variations, although the layout is virtually the same on both. One pressing includes a large silver centre ring and displays only the text; "MADE IN U.S.A." printed along the bottom rim of the disc. Whilst another copy comes instead with a standard clear plastic centre ring and includes some additional manufacturing text; "MADE IN U.S.A. BY WEA MANUFACTURING INC." printed again along the bottom of the disc. Both discs are silver with black printed text and include the regular layout showing the title at the top and the full track listing down the right-hand side. The usual Production text with the "WB Records" and "COMPACT disc DIGITAL AUDIO" logos are also present below the centre ring, with the revised Catalogue number W2-25300 included alongside on each. Around the upper outer edge of the disc is some additional Copyright information which reads; "A WARNER COMMUNICATIONS COMPANY ALL RIGHTS RESERVED. UNAUTHORIZED DUPLICATION IS A VIOLATION OF APPLICABLE LAWS". There is a Columbia House Manufactured USA cassette release which comes with a white tape with black titles. The front and back cover artwork is the similar to the European pressing. On the spine there is now a Dolby HX logo and the catalogue number which has been changed to 9 W4-25300. On the inside of the insert, it displays that it was "Manufactured by Columbia House under license", The UK Fan Club address has also been omitted. On the inside of the spine, the usual German Manufacturing information has been replaced with some Dolby information instead. There is also some additional Copyright and care for your cassette information which doesn't appear on the European release. The actual tape also displays that it was Manufactured by Columbia House under license and that it was Made in U.S.A. The second USA pressed cassette which is very similar to the Columbia House issue, but was instead Manufactured at Warner Bros. Records Inc. - 3300 Warner Blvd, Burbank, Calif. 91510. - Made in U.S.A. The front and back cover artworks is the same apart from the catalogue number on the spine has been change to 9 25300-4. The inside of the insert has also been amended to include the Warner Blvd, Burbank, Calif address instead of Columbia House. The usual UK Fan Club address has now been included. The tape is again white with black text, the layout and design is similar to the earlier Columbia House pressing, MADE IN USA has been additionally inscribed into the plastic at the top of side 2. The Manufacturing information at the bottom has also been changed accordingly. Some copies of the tape come with an additional SR printed underneath the catalogue number, whilst other copies come instead with AR. There is another USA pressed cassette which was released instead by Reprise, the layout and design is vertually the same as the second pressing apart from the Manufacturing information on the actual tape has been slightly changed to read Reprise Records, a division of Warner Bros. Records Inc., 3300 Warner Blvd, Burbank, Calif. 91510 - Made in U.S.A. On the actual spine of the front cover and on the tape itself, the usual Warner Bros. logo has been replaced with a Reprise logo. The same catalogue number is used 9 25300-4. There is another US release which comes with the same front and back sleeve as the standard USA release, some additional Manufacturing information has been printed on the back sleeve which reads "mfd. by RCA Music Service under License 6550 East 30th Street Indianapolis, Indiana 46219". An additional catalogue number R-114779 has also been displayed under the Manufacturing information on the back sleeve and on the left hand side of the record label. There is an Indiana cassette release which was Manufactured in the USA, it is very similar to the actual US Warner Brothers pressed cassette and comes with the same front and back cover artworks, it additionally has printed over the bottom of the front cover artworks in white text some Manufacturing information "Mfd. for RCA Music Service under License 6550 East 30th Street, Indianapolis, Indiana 46219". The catalogue number C114779 is also displayed in white on the front cover and in black text on the actual spine. The tape is white with black text, the layout and design is again very similar to the US pressing, but the Manufacturing information at the bottom has been changed, it reads "Warner Bros. Records Inc., a subsidiary & licensee of Warner Bros. Inc. Mfd. for RCA Music Service under License. Made in U.S.A". On the left hand side the catalogue number C114779 is also displayed. The LP release comes with the regular front and back cover artworks but there is no barcode on the back sleeve. Also displayed at the bottom of the back sleeve is some Spanish Manufacturing information which reads "HECHO EN VENEZUELA POR RODVEN DISCOS Y DISTRIBUIDO POR SONO-RODVEN", some Spanish Copyright information is also included "Prohibida la reproduccion, locacion (alquiler) y prestamo de este ejemplar y su radiodifusion o ejecucion publica. Reservados todos los derechos de los autores de las obras y del productor de fonogramas (P) 1985". There is some addition legal text which reads "DEPOSITO LEGAL NB-85-2603" and a round "P.V.P Bs.55" logo. The catalogue number "3093" is shown above the "Warner Bros" logo at the bottom right hand corner. 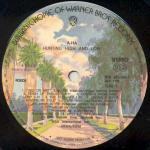 The record labels are white with the "Warner Bros." logo displayed at the top, the title "A-HA HUNTING HIGH AND LOW" is shown underneath in uppercase. The full track listing to each side is displayed both in Spanish and English. Around the edge of the label is some slightly different Manufacturing and Copyright information compared to the back sleeve, it reads "HECHO POR WEA DE VENEZUELA S.A. RESERVADOS TODOS LOS DERECHOS DEL PRODUCTOR FONOGRAFICO DE LAS OBRAS GRABADAS EN ESTE DISCO PROHIBIDA SU REPRODUCCION EJECUCION Y UTILIZACION PUBLICA". The Venezuela cassette release was manufactured by "Rodven" and was distributed by "WEA", it comes with a black tape with white text. The front cover insert is white and displays a rather darker image of the usual album artworks, the title is printed underneath in large black uppercase letters along with the usual "WB" logo. The spine and back cover is also in white and displays the title "A-ha Hunting high and low", full track listing, catalogue number "3093" and Spanish Manufacturing information which reads;- "Hecho en Venezuela por Rodven Discos y distribuido por WEA de Venezuela". There is also a round brown sticker displaying "RODVEN P.V.P BS.140" additionally on the spine. The Yugoslavia LP of "Hunting High And Low" has a similar cover to the European release but the text on the back cover has been printed much bolder, at the top next to the barcode, we have a large "Suzy" logo, whilst at the bottom right hand corner above the "Warner Bros." logo, we have some publishing information which is printed in Bosnian and reads "Izdavač: Izdavačka radna organizacija SUZJ Zagreb, Gruška 10, Jugoslavija Mušicki urednik: Ranko Antonić Direktor - glavni i odgovorni u rednik: Hrvoje Markulj". The usual German Manufacturing information at the bottom left hand corner has been partly covered up in white, leaving only the section "A Warner Communications Company" on show. There also appears to be two different pressings, although both come with the exact same front and back cover sleeve, the 1st pressing comes with picture labels featuring an artist drawing of a tree - lined street with the tracks listed in black over the bottom of the picture. At the top, we have "BURBANK, HOME OF WARNER BROS. RECORDS" in large lettering, the title "A-HA HUNTING HIGH AND LOW" is displayed underneath in a much smaller font. Around the outer edge of the label is some Manufacuring and Copyright information;- "ALL RIGHTS OF THE MANUFACTURER AND OF THE OWNER OF THE RECORDED WORK RESERVED. UNAUTHORIZED PUBLIC PERFORMANCE BROADCASTING AND COPYING OF THIS RECORD PROHIBITED. PRESSED BY JUGOTON". It also has displayed at the bottom "SUZY RECORDS PRODUCTION". The second pressing comes with the more usual white lined label with black text, it displays the "Warner Bros". logo at the top with the title underneath, the track listing including the credits and production information is shown on the lower half of the label. Around the outer edge is the exact same Copyright information which appeared on the first pressing, although the "Pressed by Jugoton" has now been omitted and replaced instead by "Warner Bros. Records Inc./WEA Internaional Inc". The first pressing appears not to come with the usual inner sleeve but the second pressing additionally included one. The catalogue number on both pressings is however exactly the same 925300-1. The cassette has a slightly different sleeve compared to the UK release. The picture on the front is similar to the LP cover with "a-ha hunting high and low" printed in green and red letters within the picture. Above this, on a white background, "a-ha" and the title are printed in red letters. "Suzy" is printed in large letters on the spine, next to the title. The cassette is black with yellow labels and black text. The Zimbabwe LP release is very similar to the South African pressing which again comes with the same duller front and back cover compared to the German release, the round circle displaying the printed text "Includes the hit singles TAKE ON ME and THE SUN ALWAYS SHINES ON T.V." is also shown on the right hand side of the front cover. On the back cover the same Catalogue number WBC 1594 as the South African release is displayed in the top right hand corner, it also additionally shows that it was "Available on Cassette: ZWB 1594". Along the bottom of the back cover, the usual "Warner Bros. Records Inc." handwriting is on display but has been partly printed over with some black Marketing and Copyright information which reads "Marketed by WEA (Pty) Ltd. A Warner Communications Company a division of Warner Communications Inc. All Rights Reserved - Unauthorised Duplication is a Violation of Applicable Laws". The actual Label on the Record is white and unlike the South African pressing, all of the text including the "Warner Bros. Records" logo is printed in black rather than some parts being in colour, the actual layout and design also differs, around the top outer edge of the label, we have some Copyright information, plus that the record was "Manufactured by TEAL Record Company". On the lower half of the label, we have the title "HUNTING HIGH AND LOW A-Ha" with the full track listing and production credits included underneath. The record speed 33.3 is shown on the left hand side and the catalogue number on the right hand side. There is no additional inner sleeve.